Wheatley issues his normal warning about the dangers of black magic in this piece, while at the same time impressionable young persons like myself were reading his supernatural novels, not to mention many far more subversive works such as Richard Cavendish’s the Black Arts and the famous partwork Man, Myth and Magic. 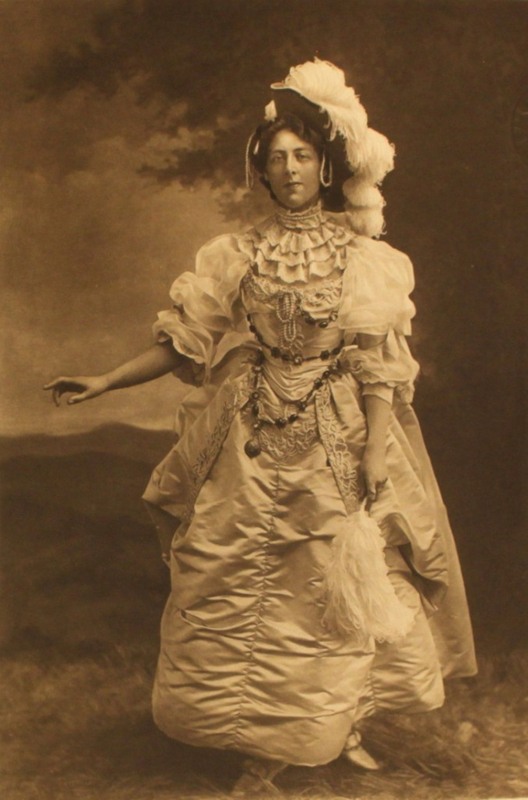 Aleister Crowley, the Great Beast (who Wheatley may have had in mind for Mocata, the villain in “The Devil rides out”) was another Chelsea resident, like Hester Marsden-Smedley, the wife of the Mayor of Chelsea who wrote many articles for the Times on local history and reported in one that she found Crowley “fascinating but not frightening“. 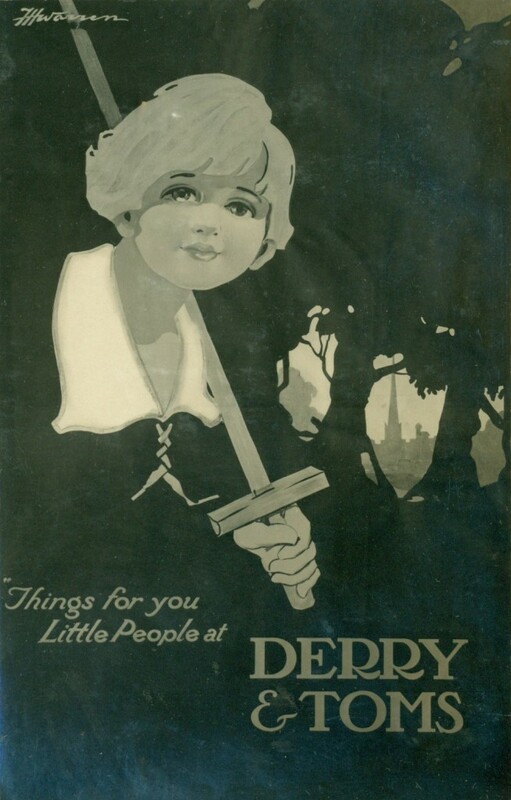 (She found another local resident far more repellent in a piece remembering William Joyce’s short period of membership of the local Conservative Party). 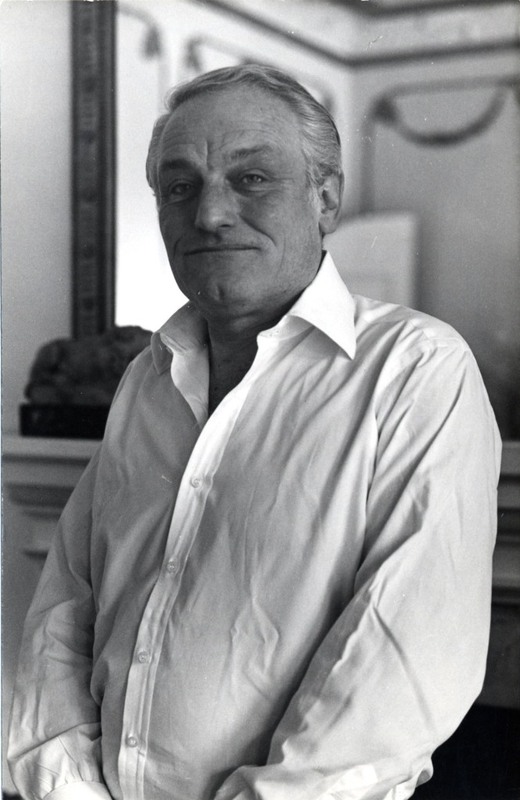 In the film of the Devil rides out, Mocata was played by Charles Gray (of Ennismore Gardens) profiled in the Times in an article called “Elegant baddie”, and photographed by Bignell. Wilson was also a friend of another subject of an article in the Times of Chelsea, local artist Regis de Cachard (or Count Regis de Bouvier de Cachard de Montmeran, to give him his full name and title). 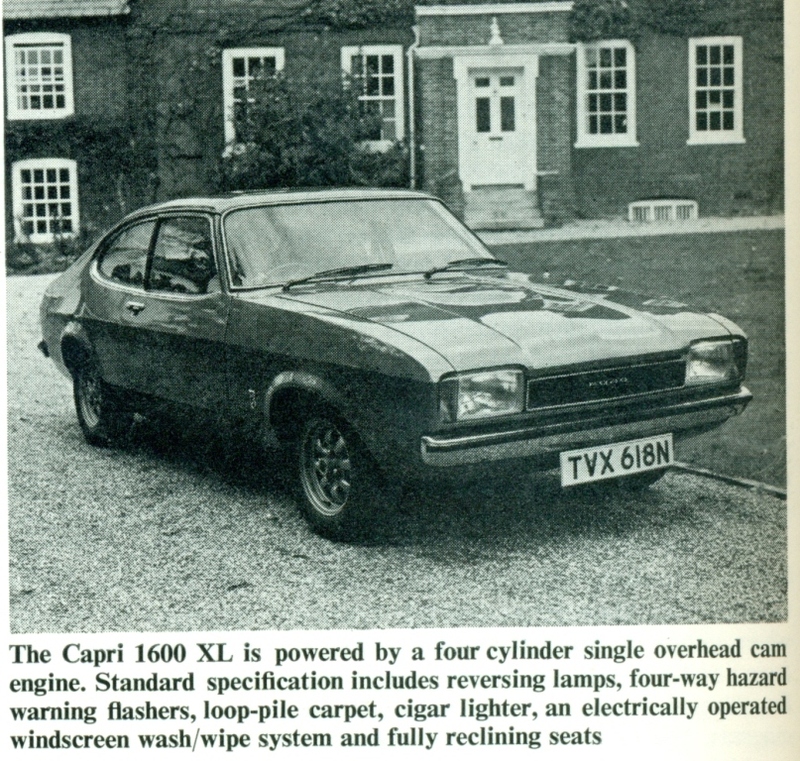 There might be a motoring feature, like this one which also relates to a previous topic on the blog. You also find some interesting photos, like this one under the headline “End of the Essoldo”. 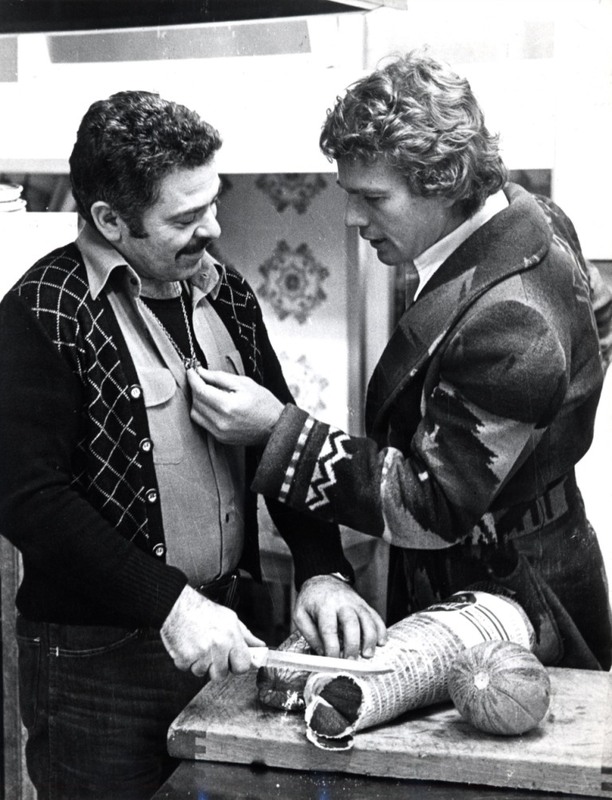 John Bignell provided some celebrity pictures like this one. “Hand made in Yugoslavia” for Bianca Busaglia. They were everywhere. 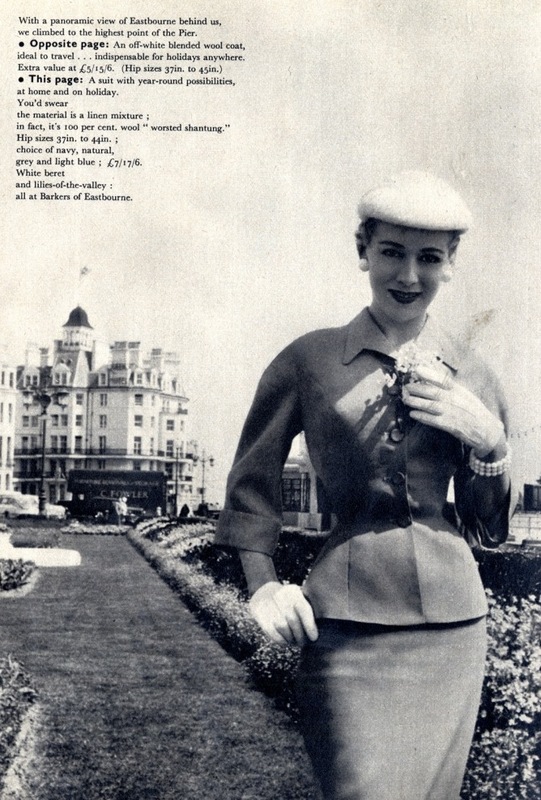 Now, I’ve looked at fashion in old photographs before as you know. (Sambourne, Hawarden etc). And I was living in London from 1973. 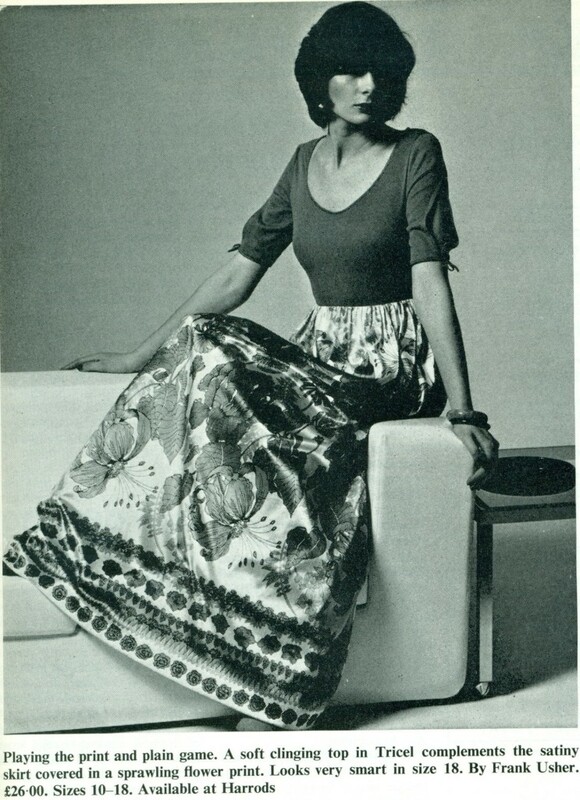 I hadn’t remembered that this was the era of the maxi skirt and dress. But it was. But back to the Times. Is this a nightie? No, it’s a maternity dress from a shop called In Pod, perfectly in tune with current styles. Check out the shoes by the way. Spot on for this period. 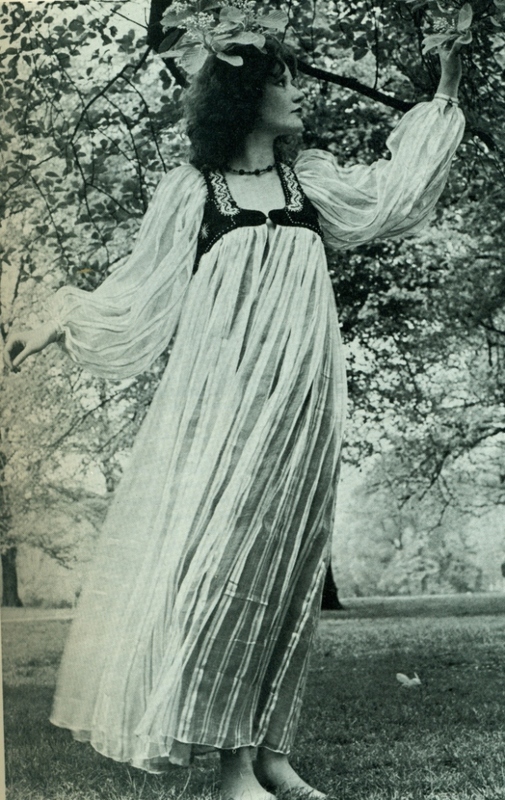 That is a nightie, from a shop called Night Owls in the Fulham Road. 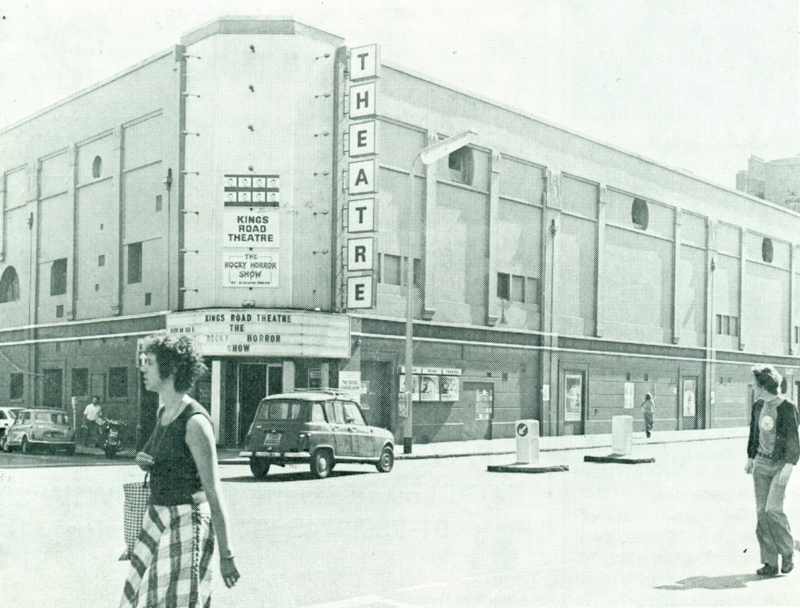 (At number 50, next to where there was a branch of Gapp’s – see this post. It closed a few short years ago.). 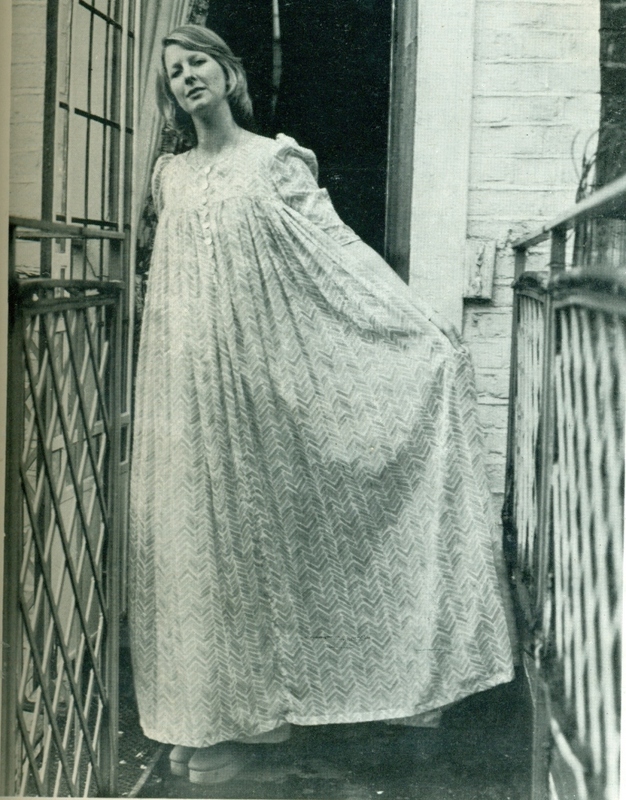 We’re glad it’s a nightie and not another maternity dress – she’s smoking, something people used to do back then. This is a whole page on a shop called Joseph, at 33 King’s Road. 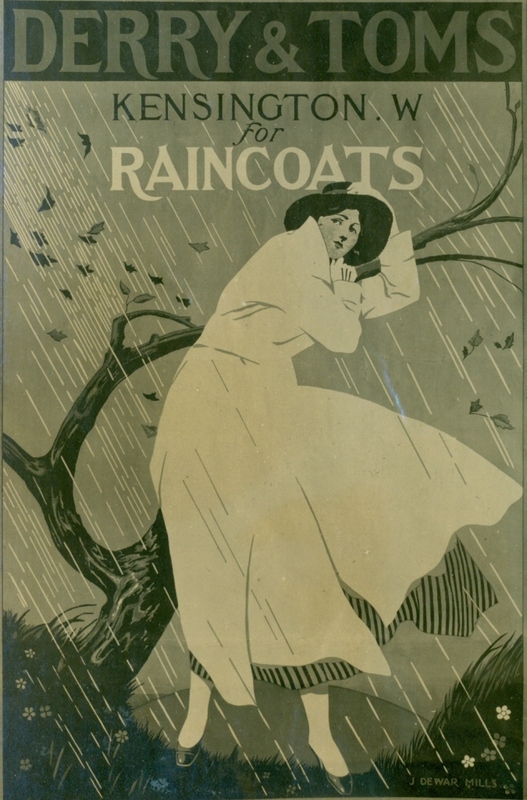 My wife had a raincoat like that. 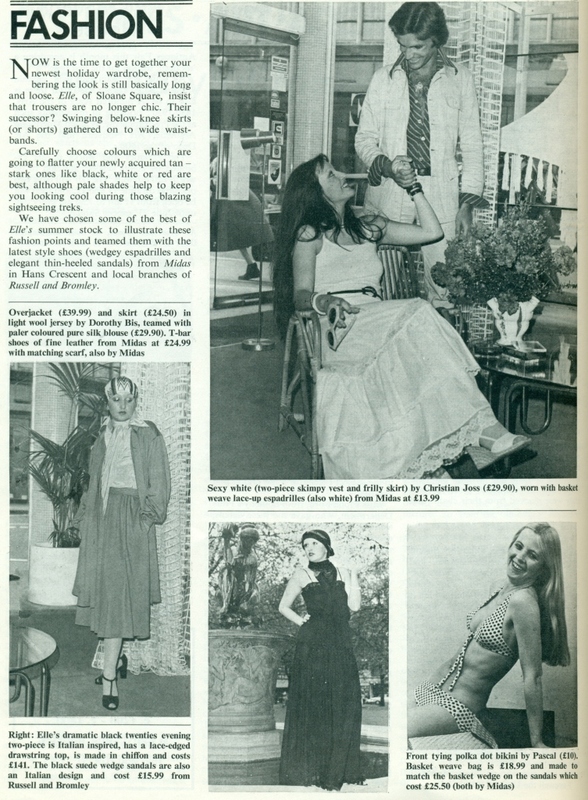 In the interests of historical accuracy I went to the costume and fashion collection at Chelsea Library to look at copies of Vogue from 1973 to 1975, the Times of Chelsea years and yes, there were many pictures of much the same sort of outfits, some even more extravagant, and of course colourful. 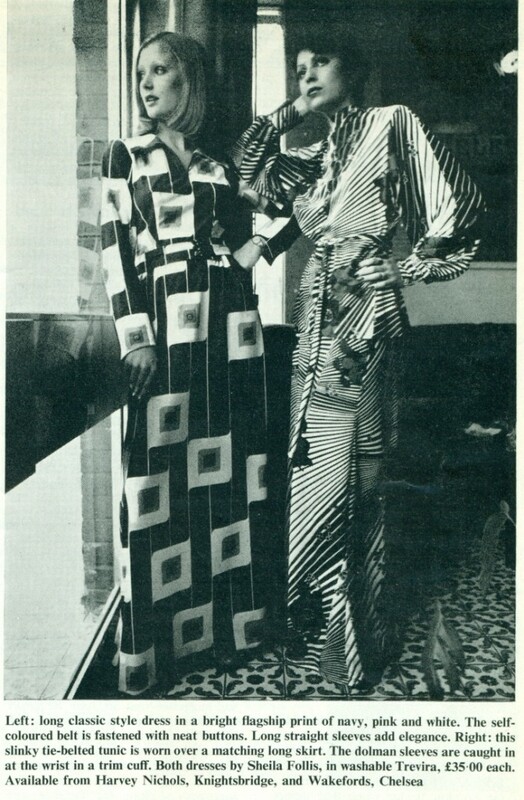 There was a kind of soft focus extravagance about this period exemplified by the fashions of the Biba shop which reached its peak in Kensington and Chelsea at the same time. The maxi has been back with us for some time. I saw many examples on the way home today. (A very warm Wednesday afternoon). Dennis Wheatley, Charles Gray, Colin Wilson, Regis de Cachard and the Ford Capri are unfortunately gone, though not forgotten. I’ll keep my fingers crossed for Patricai Meara (later Pratt). It was a bit of a ramble this week, but magazines are sometimes like that. 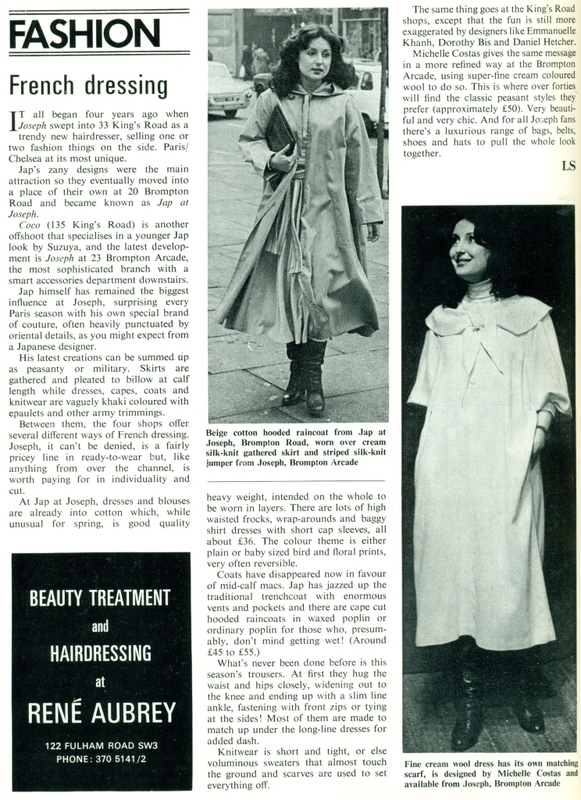 I’m not deliberately intending to turn the postscript over to obituaries but I couldn’t help but note the passing of Richard Neville, the editor of another small magazine, the “underground” periodical, Oz. I was too young, and too far from London to be a regular reader, but the Oz obscenity trial was a sensation of the time and I do remember the controversy and the taking of sides. I was firmly behind the three editors, Neville, Felix Dennis (the millionaire publisher and poet who died in 2014 ) and Jim Anderson. I remember reading a book by Tony Palmer, the Trials of Oz, which portrayed the trail as a knockabout yarn. I couldn’t wait to get to London. Now the weather is warmer and we’re in the serious summer, we can relax a little and revisit an old friend, the artist and illustrator Hugh Thomson. 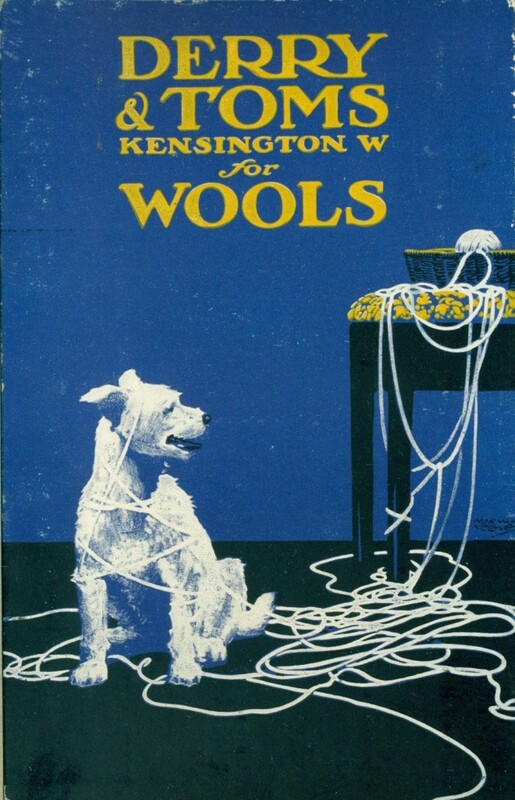 Along with his annual “big books” with colour pictures, a couple of which we’ve already looked at, he also had some regular jobs which kept the wolf from the door. 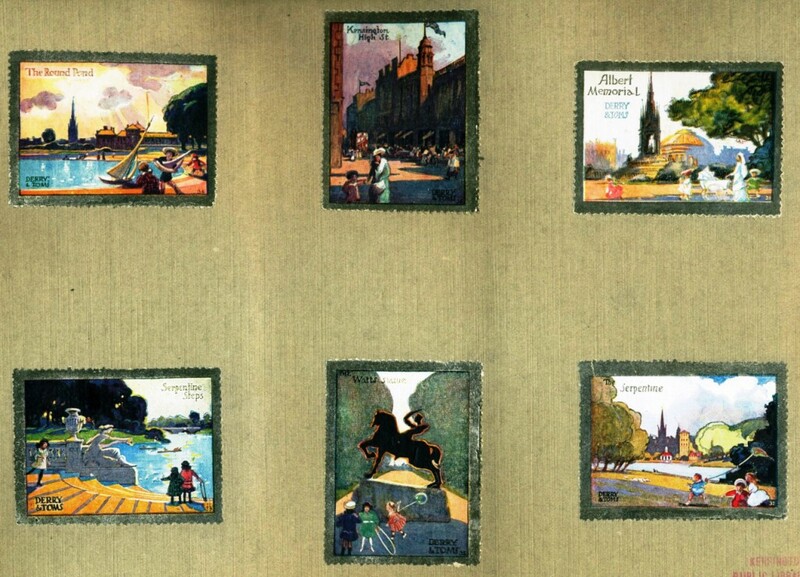 One of those was the Highways and Byways series. These were travel books of British counties, informative but chatty, written and illustrated by a variety of authors and artists. 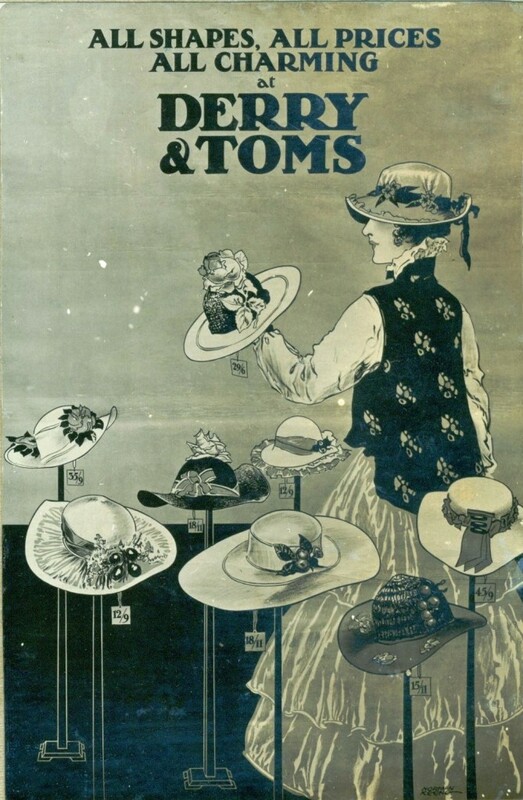 Thomson worked on several books in the series but the one of most interest to us is Highways and Byways of London, published in 1902 with a text by Mrs E T Cook (Emily Constance actually, don’t know where the T came from.). 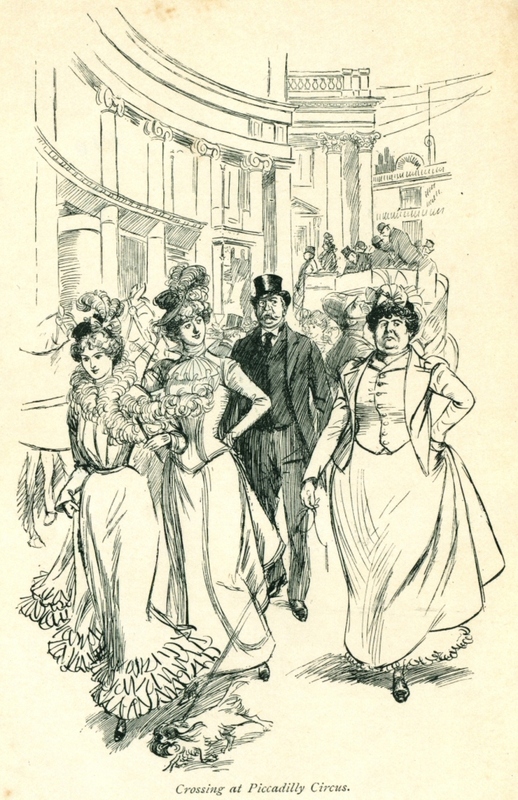 Some of the illustrations were by the leading engraver F L Griggs, who tended to do the sober pictures of streets and churches. 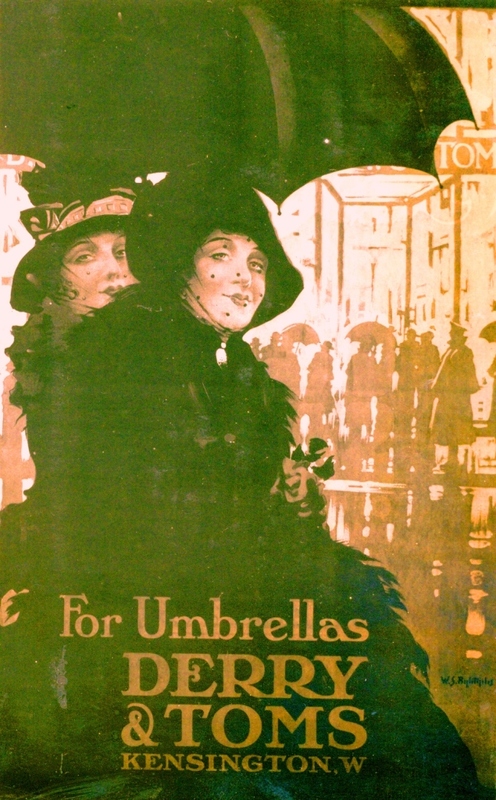 Thomson concentrated on the life of London and particularly its people. 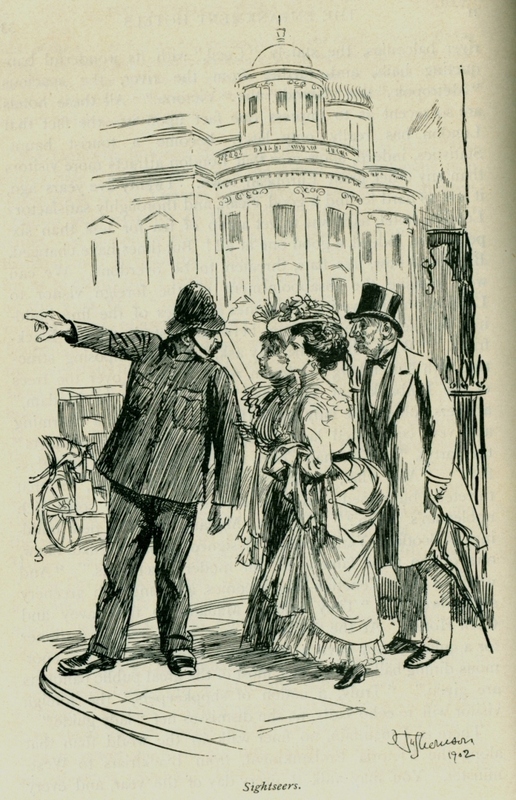 Here’s a typical London scene, someone giving some directions. Third left, second right, You can’t miss it. 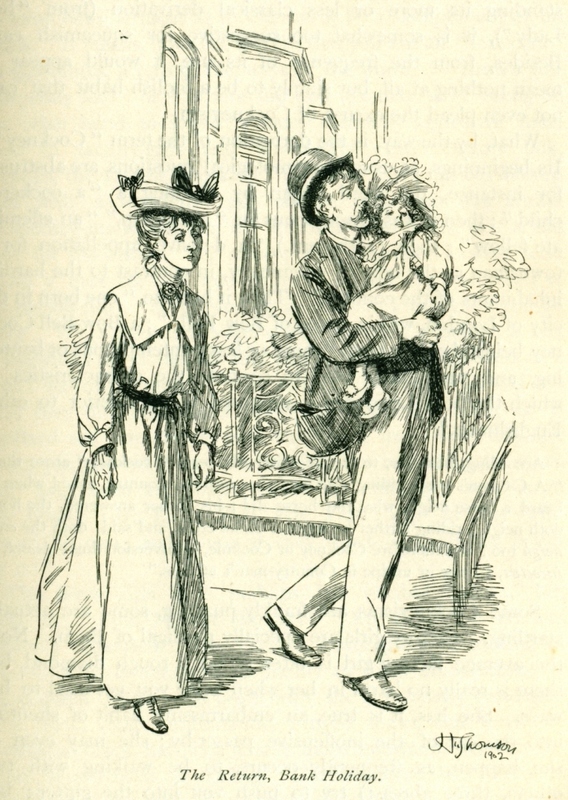 Thomson captures the confidence of the policeman, the confusion of the older man and the anxiousness of the mother and daughter attempting to follow the complex instructions. They might be forgiven for taking the tube instead. Except that it looks a bit frantic down there. This is clearly one of London’s defining characteristics as Thomson saw it. In his London there seems to be quite a bit of rushing about. 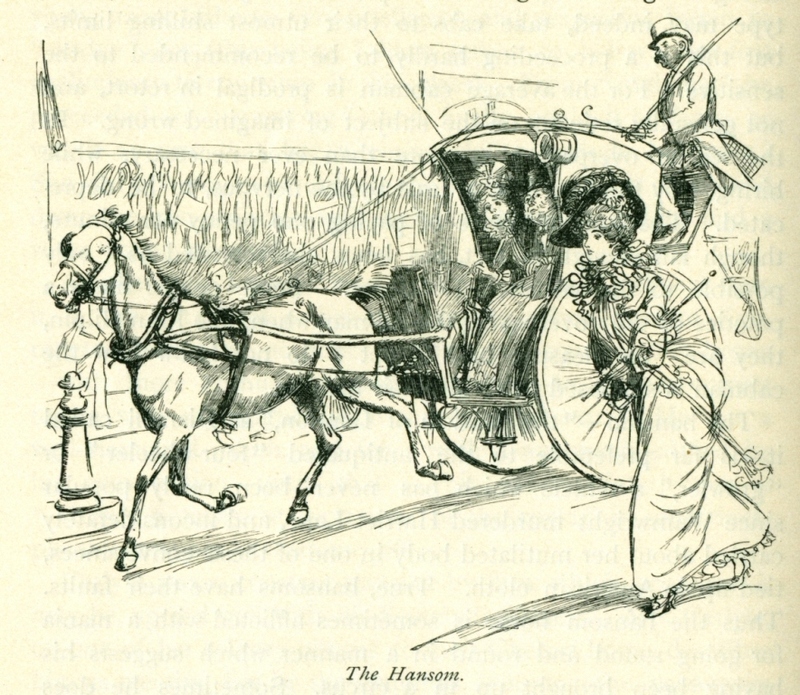 The picture is called The Hansom, but the focus is on the brisk young woman who is threatening to overtake the horse drawn carriage. 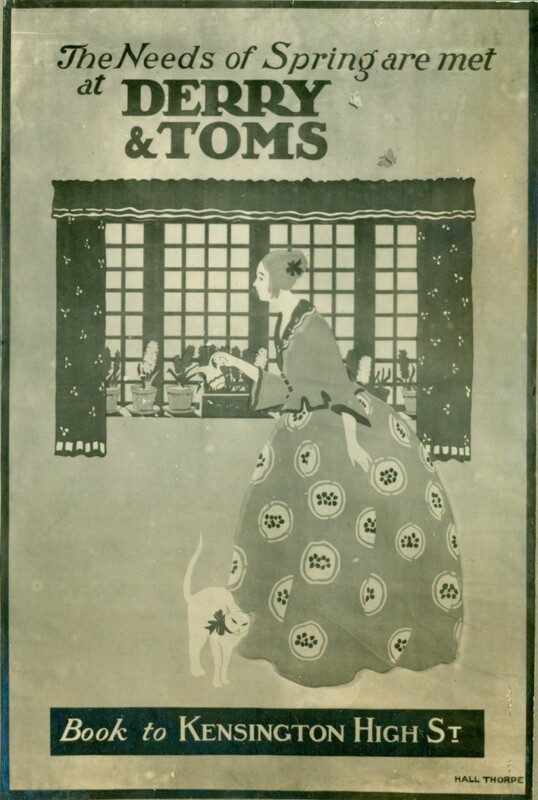 Thomson’s favourite period for women’s dress was the 18th century, and perhaps the early 19th (which you can see in other posts here and here) He had come to admire contemporary fashion almost as much. See some pictures of the Row later. 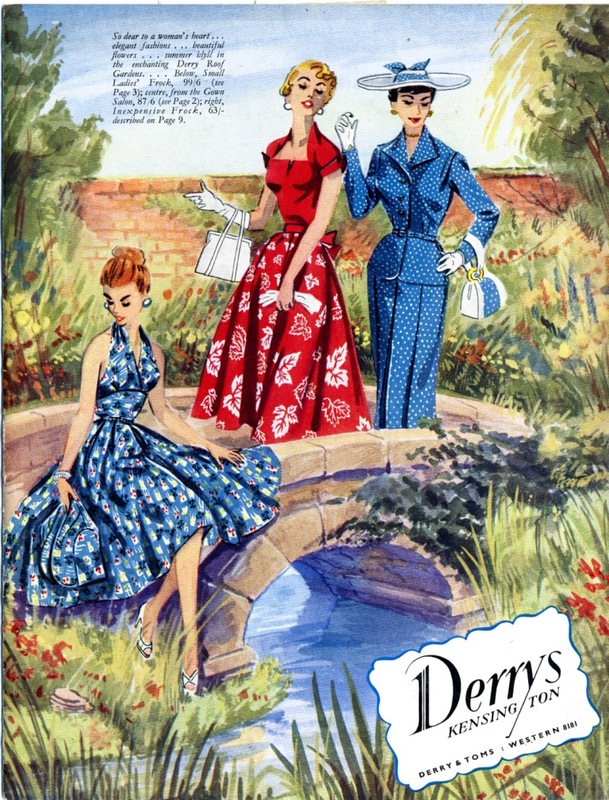 Below, a pair of fashionable young women cast a sidelong glance at an older lady walking a tiny dog. I wonder what the woman at the rear of the group is looking at? Something going on in a first floor window? I originally intended, as I have with other travel books, to quote relevant passages from the text. But although the Royal Academy picture is placed in a section on London galleries, the author doesn’t mention it at all. You get the impression that author and artist weren’t exactly working closely together. Thomson seems to have followed his own interests in selecting subjects. 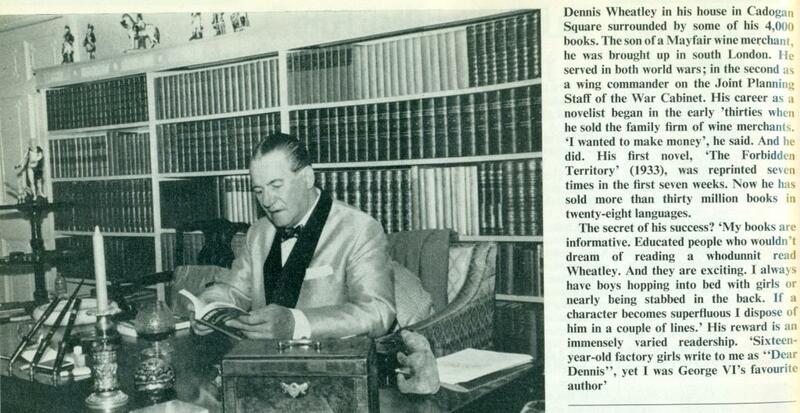 Literary London was clearly one of those. A group of book fanatics are clustered around a shop in the Charing Cross Road, the southern end I think, opposite Leicester Square station. Charing Cross Road was one of the first places I visited regularly when I came to live in London and apart from the clothes this scene is quite recognizable. I can pinpoint it almost exactly in my memory. Of course in 1973 very few young women had to gather up their skirts to get past a gathering of enthusiasts. Male book lovers are also in the majority in this picture of a railway bookstall. 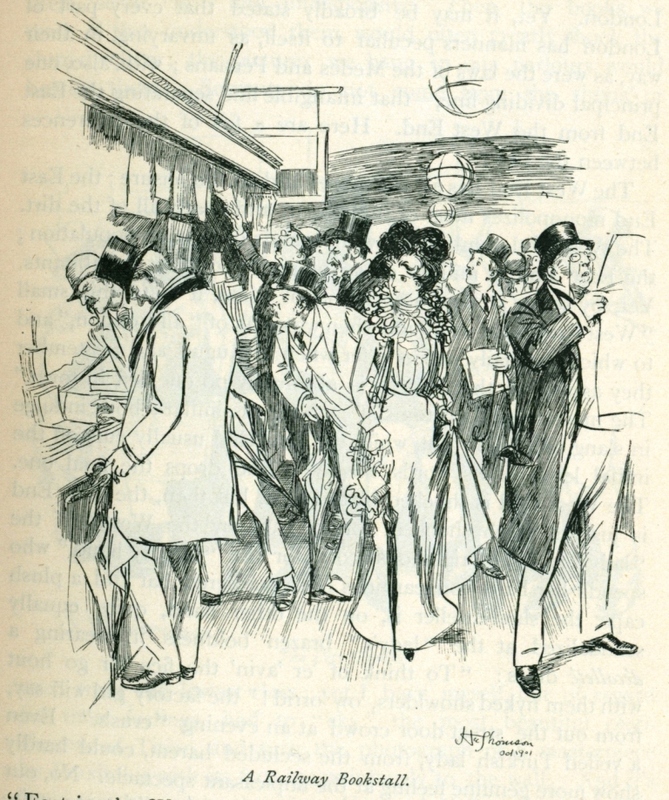 The lone woman looks on as if faintly amused by the concentration of the book-buyers. 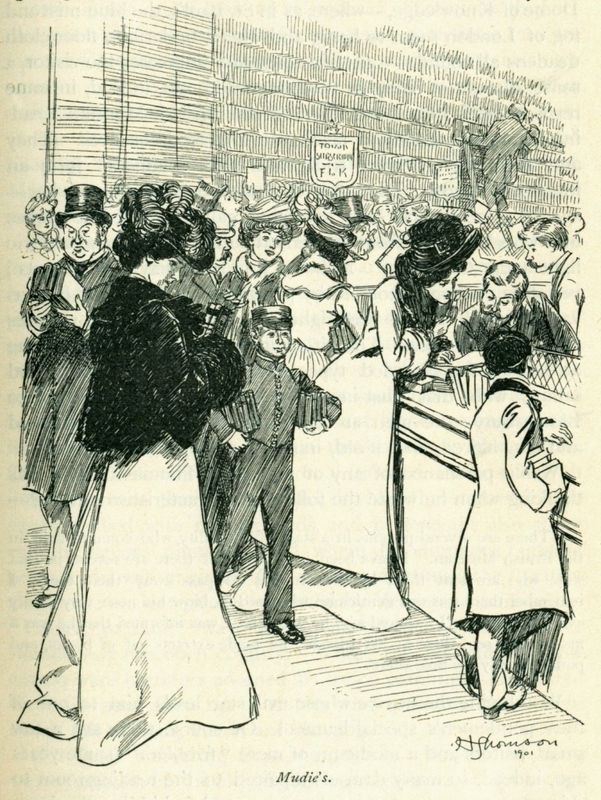 The bookstall was one of the key features of a large station. Literacy had increased in the last decades of the 19th century and the appetite for literature, high and low, had grown enormously. Even today, nothing beats a book for whiling away the time on a train journey whether short or long. 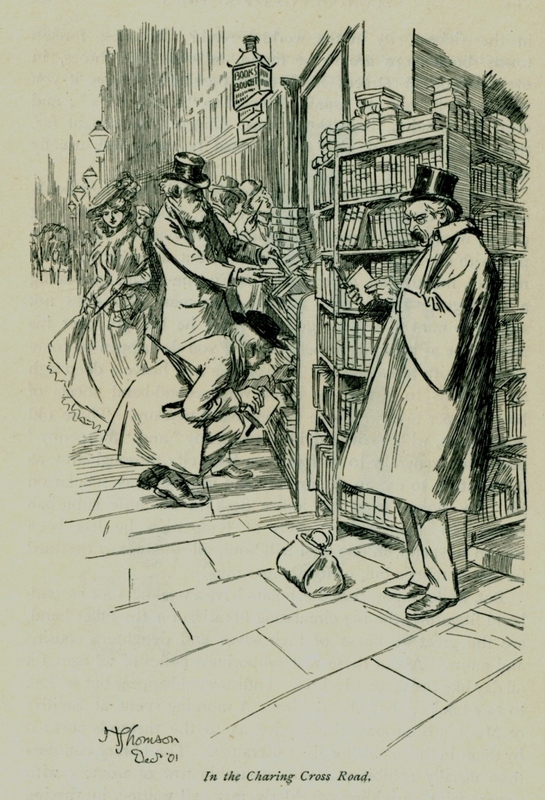 Thomson continues his look at London’s readers in one of the circulating libraries. 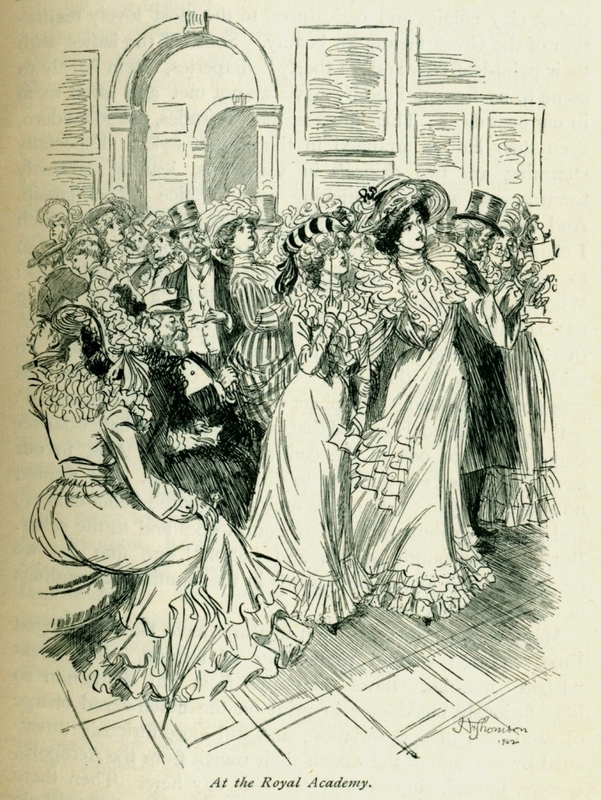 At Mudie’s, one of the leading subscription libraries the female customers seem to be in the majority, examining the latest titles and discussing the finer points of modern literature. 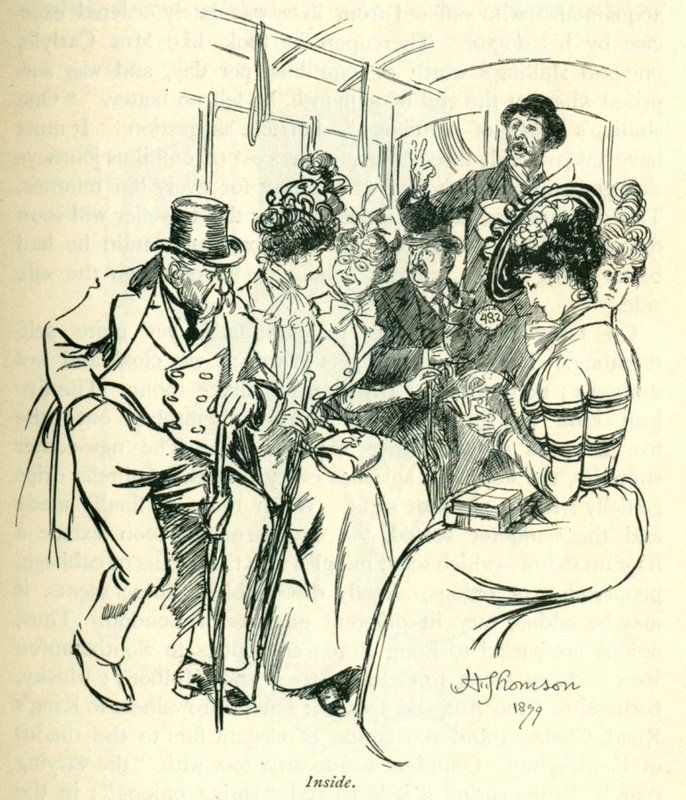 A messenger boy is carrying two armfuls of books, coming in or going out and a gentleman is looking at a set of books – a four volume novel? In the background a library assistant ascends a rolling set of steps in search of some particular volume. 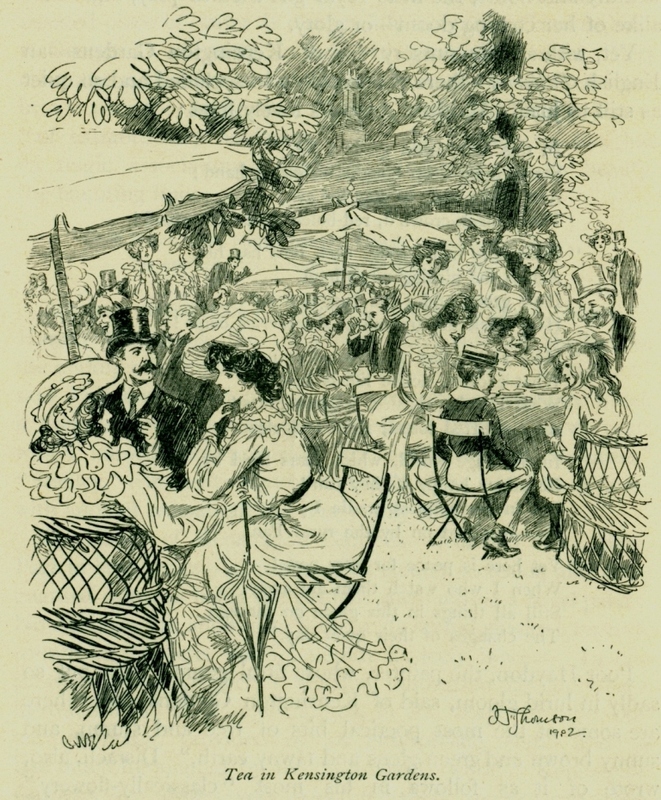 Thomson also covered some staider pursuits, such as al fresco dining in Kensington Gardens. A little further east in Hyde Park things were a little more athletic. 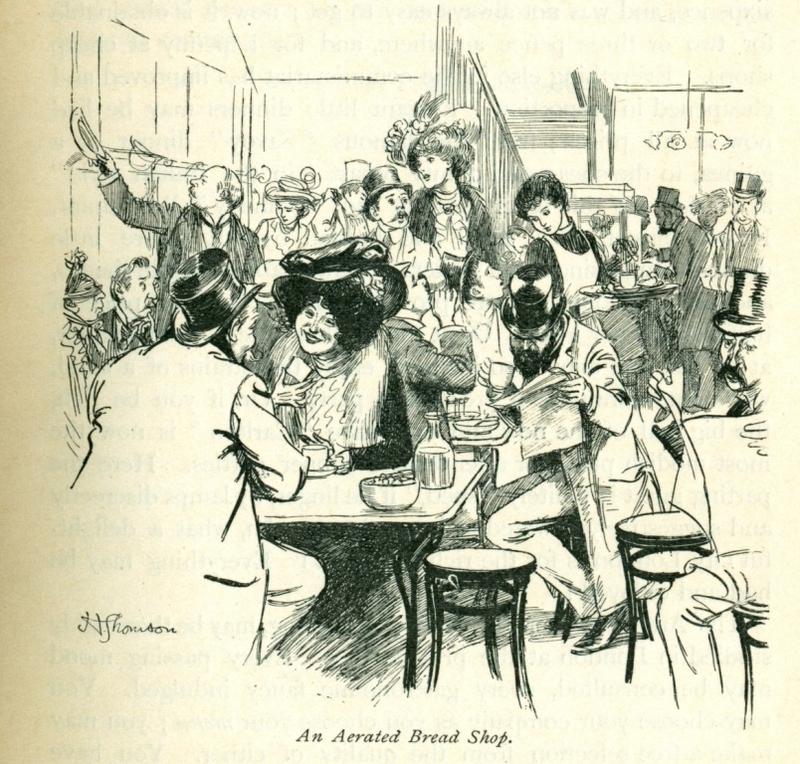 The woman in the foreground seems quite determined to avoid the attentions of the man raising his hat. 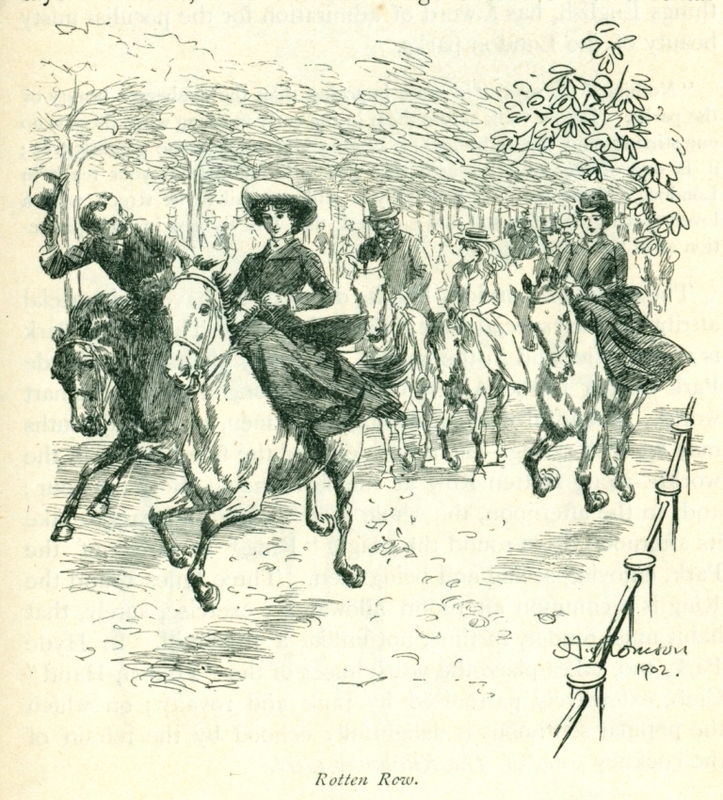 Perhaps she’s in a race with her friend, whose horse is also galloping. The dark coloured horse seems as determined as his rider. Perhaps he wants to attract the attention of the filly. Of course, for others, the horse is just a comfortable place to sit while engaged in polite conversation. The family in the first picture could always of course have taken the bus. This driver looks like an obliging fellow, ready for a casual chat with his passengers on the upper deck. Downstairs the conductor is collecting fares. He signals the number of coins required to the old gentleman groping for change in his deep pocket. Meanwhile a book-loving lady is opening her purse, her latest purchases (or loans) wrapped up neatly on her lap. The bus might be crowded but it would get you home in style. At the end of a long day, getting home again might be the best part. This Bank Holiday couple look exhausted after their day’s outing. Thomson does what he does best – catching nuances of expression and details of clothing. You can easily imagine this couple’s life, he a clerk in the City, she at home with their daughter in their first home together, part of an emerging lower middle class engaging in new leisure activities, wearing their Sunday best. They make me feel tired, so I’ll put my feet up now and look forward to the next Thomson post which will be in a couple of weeks or so and will take us back to the same era as the first Thomson book I wrote about. 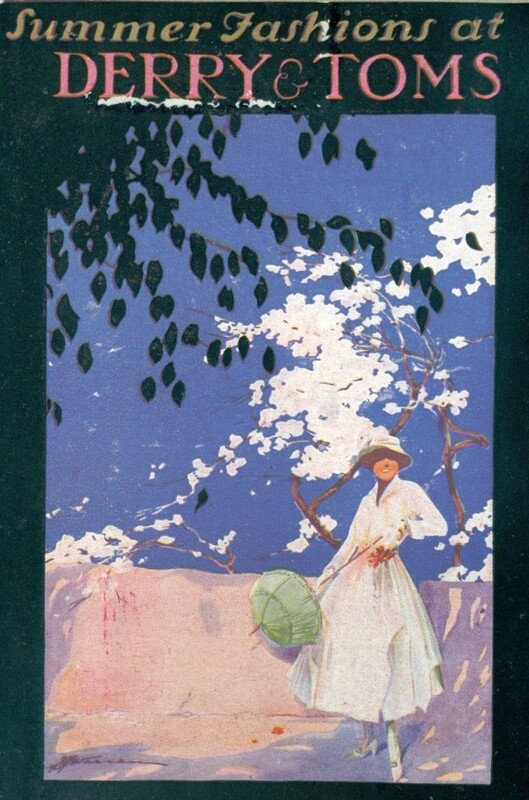 I’ve looked at a few other examples of Thomson’s work in the Highways and Byways series. The volume on Kent (1907) is typical. 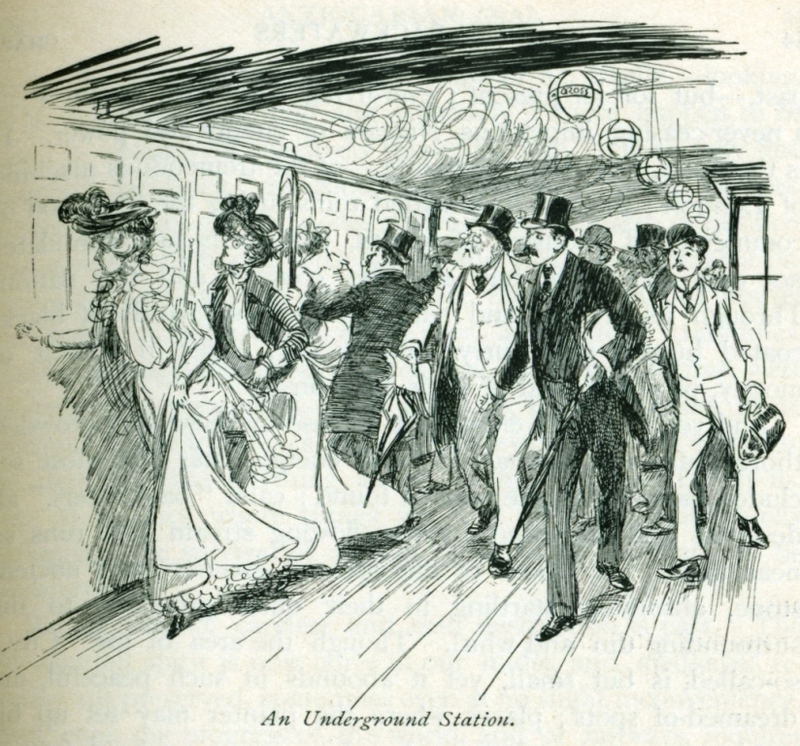 The drawings are much sketchier than his London pictures, and much more concerned with depicting the rural settings. Thomson was at heart a country boy, and a lover of rural scenes. 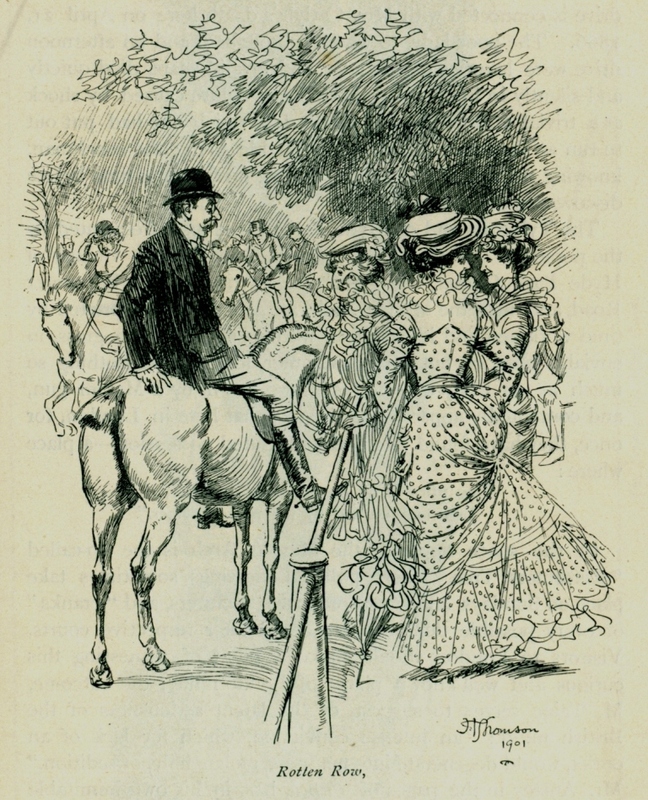 The London pictures are more in line with his work for novels and plays, of which we have seen many, and hope to see more. Now as soon as I wrote those words I thought I’d better check some others, other than Kent. 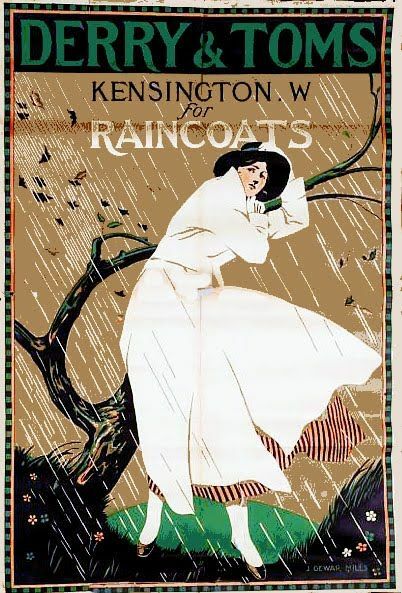 F L Griggs did some on his own but Thomson often worked with other artists such as Joseph Penniel. 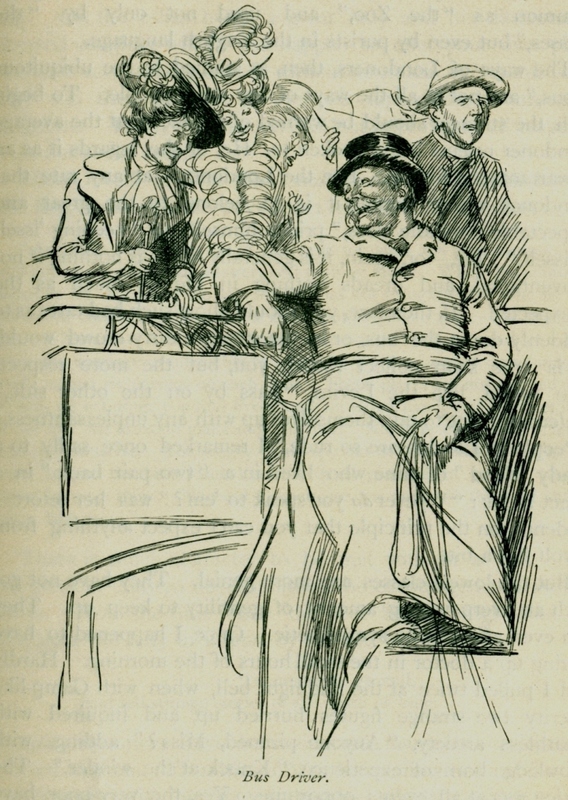 In the North Wales (1893) and Devon and Cornwall (1897) volumes I found a few character based illustrations. 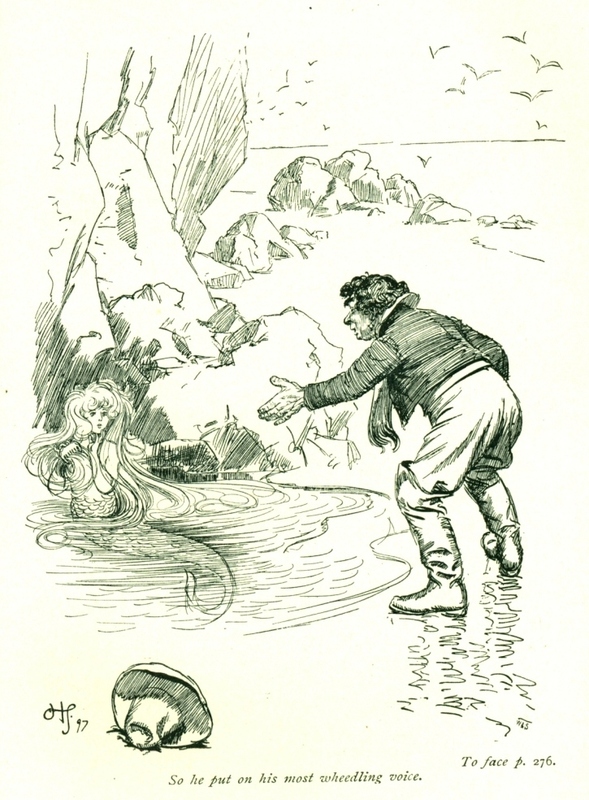 So here’s a bonus picture from the Devon and Cornwall volume, depicting a rare move into the realm of the fantastic with a folk tale about a man who encounters a mermaid on the beach. 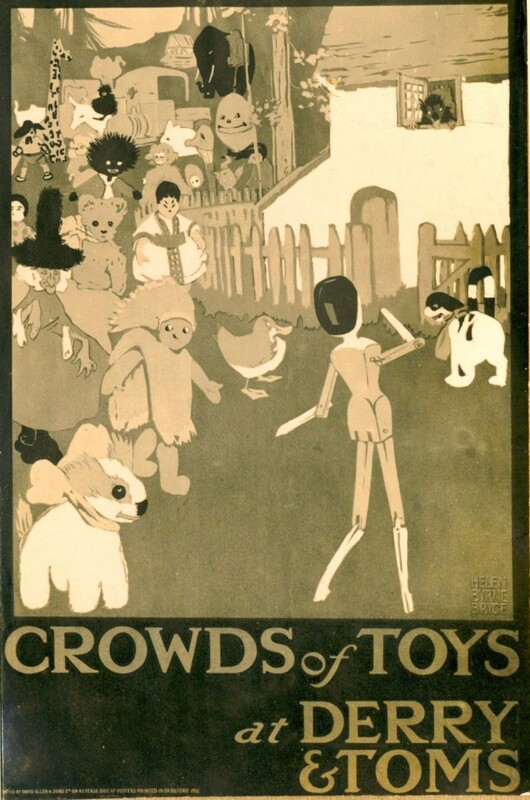 Thomson did a few fairy tale books in his career. Perhaps he should have done more. 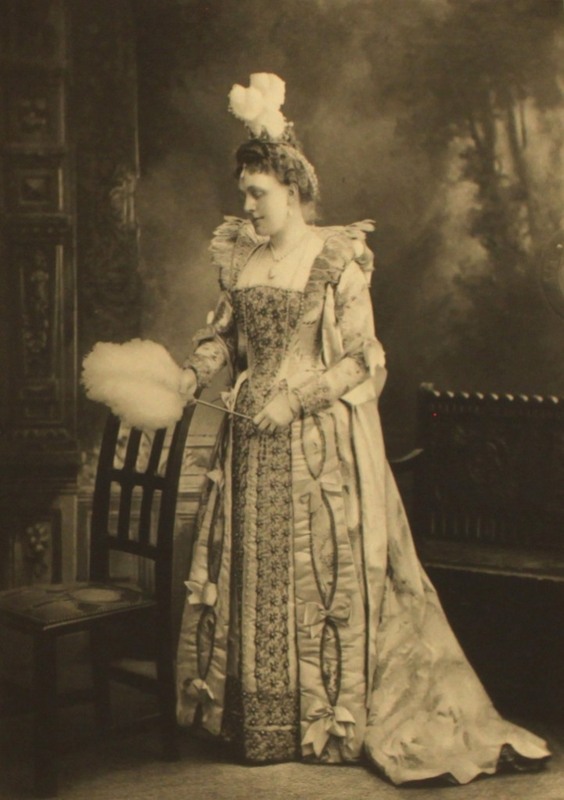 It’s January, so we start the new year by going back to the Duchess of Devonshire’s Jubilee Costume Ball of 1897, for another visit. But don’t think I’m scraping away at the bottom of the barrel. There are still plenty of interesting costumes to see, and no shortage of eminent ladies (and a few gentlemen) who had put some considerable effort into selecting their outfits for the event. This is the Duchess of Marlborough, in the role of “the wife of the French Ambassador at the court of Catherine the Great of Russia”. 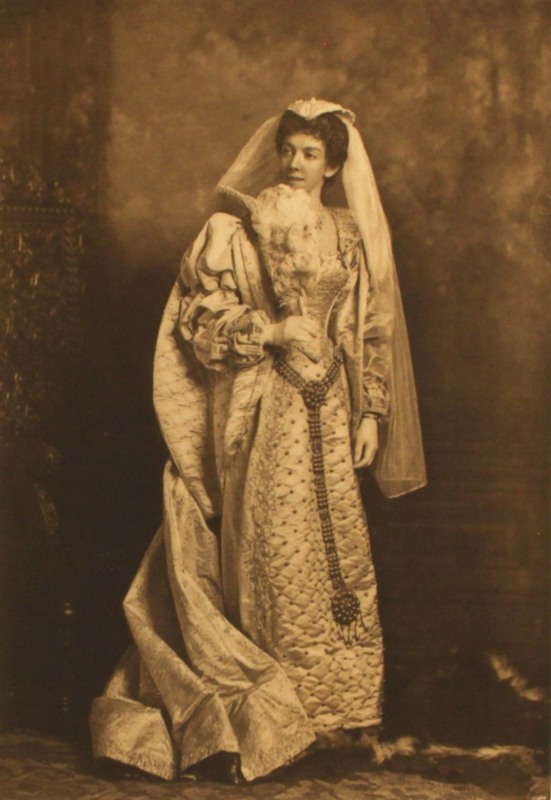 The Duchess was formerly Consuelo Vanderbilt an eligible American heiress who was apparently forced into her marriage (to the 9th Duke of Marlborough) by her mother. The marriage ended in divorce in 1921. 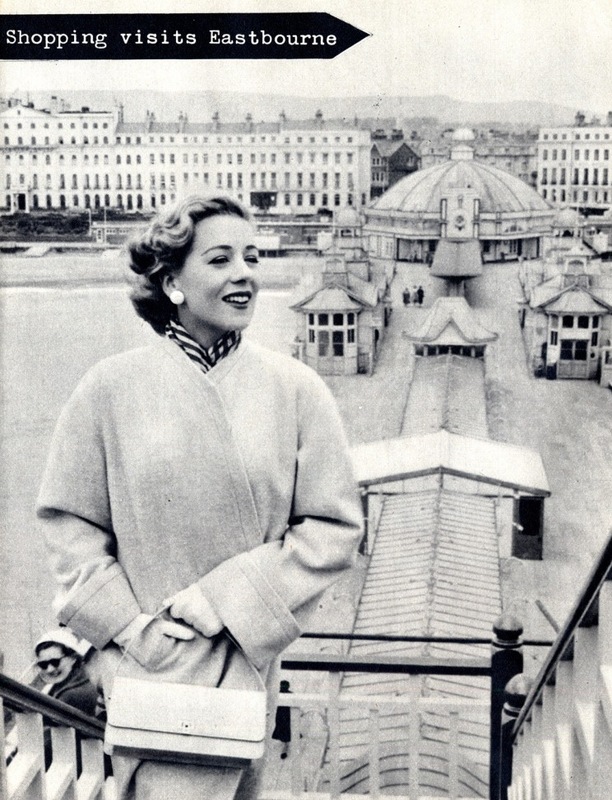 She remained friendly with some members of her husband’s family including Winston Churchill. 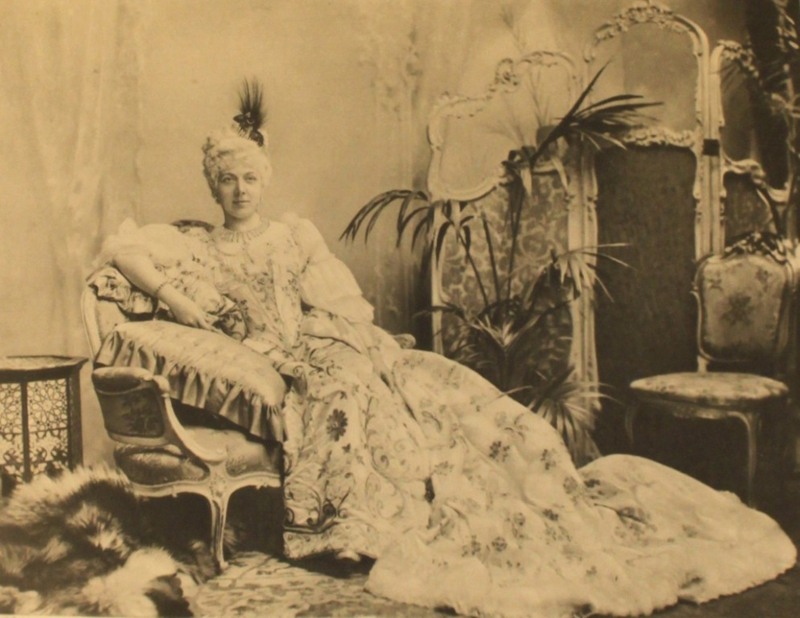 Princess Ekaterinawas a close friend of the Empress Catherine. She lived in Edinburgh from 1776 to 1782 and on her return to Russia became Director of the Imperial Academy of Sciences, the first woman to hold a hign government post. 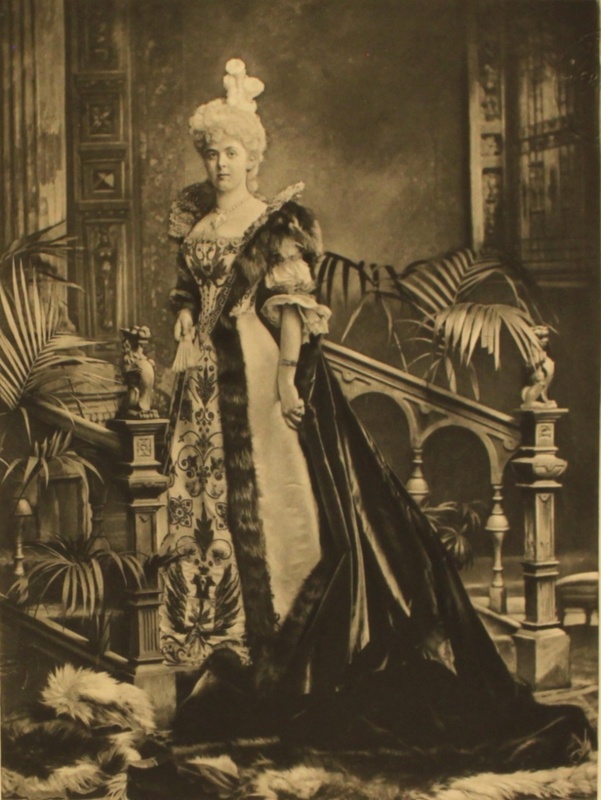 The Duchess of Newcastle, Kathleen Florence May Pelham-Clinton was a celebrated dog breeeder. Should I risk boring you with a slight coincidence? The Duchess died in the year of my birth and shared two of her Christian names with my mother. 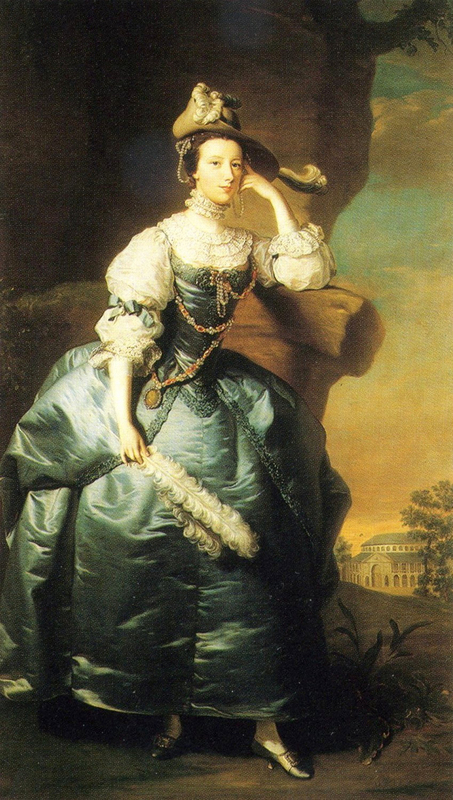 The Countess of Yarborough is another “lady of the Empress Catherine’s court” according to our book of the Ball. (It must have been quite a challenge for the photographer’s assistants to get all this information down, hence the occasional unknown name). 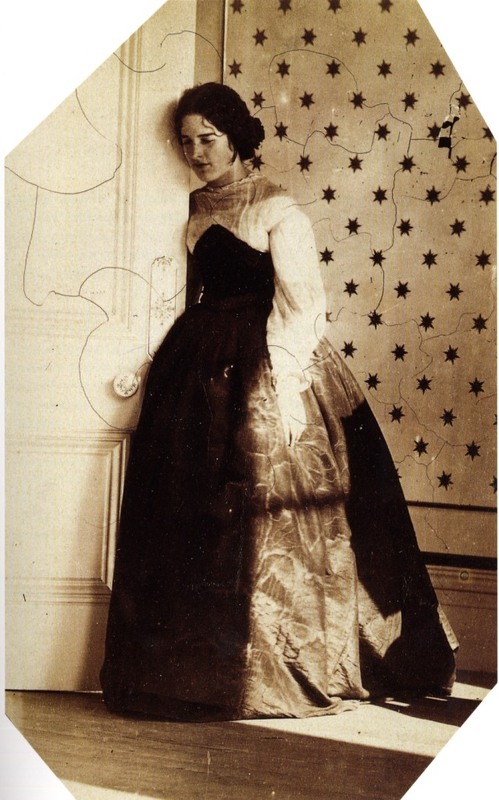 Further research tells us that Marcia Amelia Mary Pelham was playing another Countess, Countess Tchoglokov. She was also two Baronesses, Conyers and Fauconberg, if that information takes your fancy. 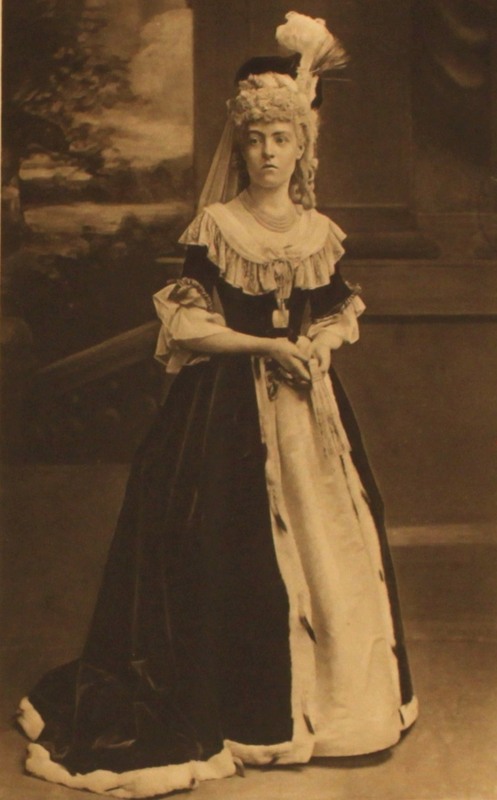 Coming back to these islands, the Countess of Pembroke, Beatrix Louisa Lambton is another of those guests playing one of their own ancestors. 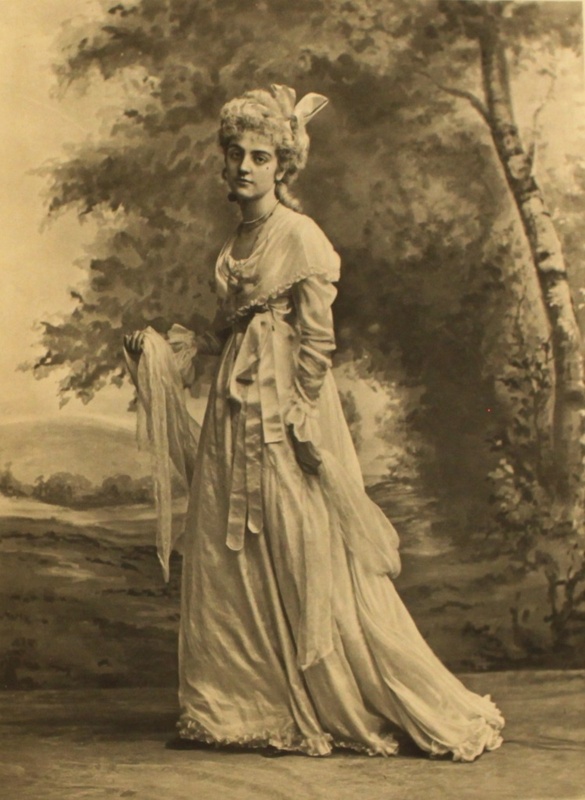 She is Mary Sydney, the Countess of Pembroke, sister of the poet Philip Sydney and a poet in her own right. She was a highly educated woman who was a patron of both the arts and sciences. She edited some of her brother’s works after his death including Arcadia and may have known Shakespeare. At one point she lived in Crosby Hall, the building famously transported from the City to Cheyne Walk, in Chelsea in the 1920s. 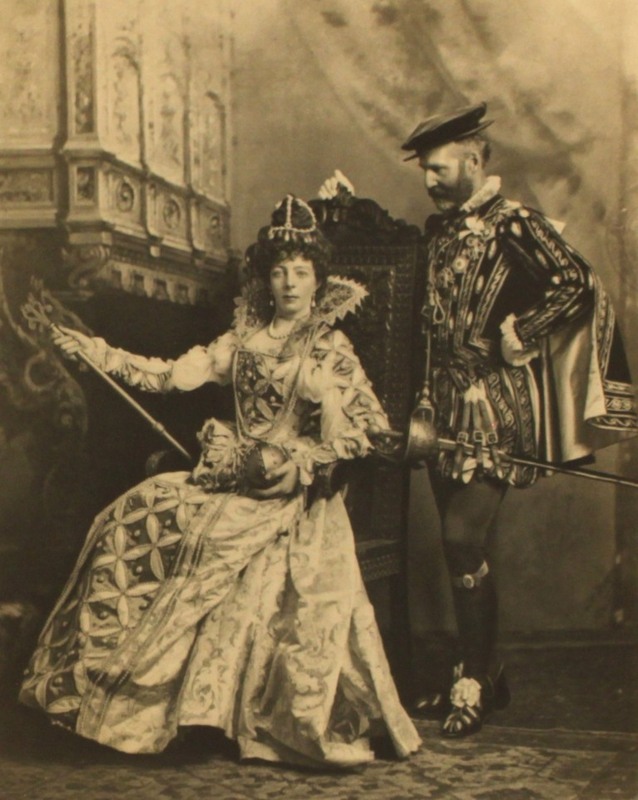 Queen Elizabeth herself, played by Lady Tweedmouth, while her husband Lord Tweedmouth plays Robert Dudley, the Earl of Leicester, the Queen’s favourite. An intriguing pair of roles for a married couple to play. Lord Tweedmouth was Lord Privy Seal under Gladstone. His wife, Fanny Octavia Louise was another member of the Spencer-Churchill family. She died of cancer in 1904. 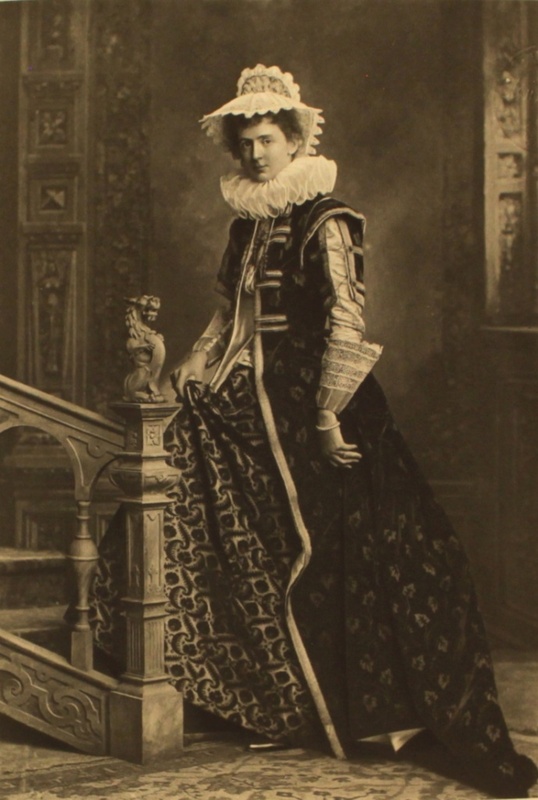 Continuing the Elizabethan theme, and coming slightly down the social scale Mrs Arthur James plays Elizabeth Cavendish, the daughter of Bess Of Hardwicke (Countess of Shrewsbury) who married the 1st Earl of Lennox, Charles Stuart. 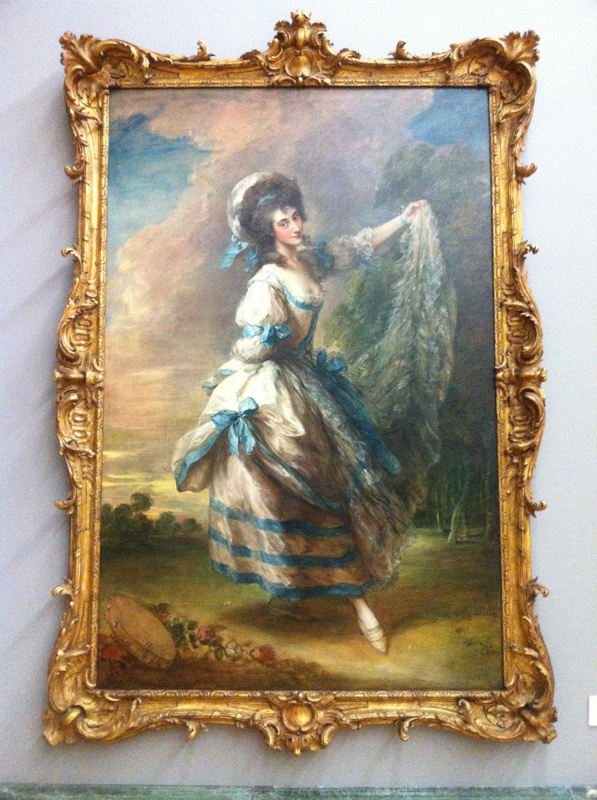 She is played by another lady making use of the feathery fan, Mrs C G Hamilton. Lady Dudley is famous for falling downstairs and dying in suspiscious circumstances, supposedly to clear the way for Queen Elizabeth to marry Sir Robert. This of course never happened. I wonder if Mrs Hamilton stayed away from Lord and Lady Tweedmouth during the Ball, or if they just laughed about the suggestion of murder? Perhaps we should turn to some guests whose costumes have a purely aesthetic effect. This slightly confused lady is noted down as simply Lady Bingham, with no suggestion as to who she represents. Other guests chose roles from the world of art. A pretty accurate rendition I would say. the orginal painting is in the collection of Tate Britain. I haven’t been able to find an exact image of the original but this is based on a miniature by Cosway. I’m surprised I haven’t used him before. Possibly because the picture is labelled “period of Louis XVI” which deosn’t quite fit with the Roman style costume. It’s a good picture though. There are still some pictures left for another post another day but let’s finish on one of the lying down poses. Maria Leschynska was the daughter of King Stanislaw I of Poland (not a king for very long) who married Louis XV of France. 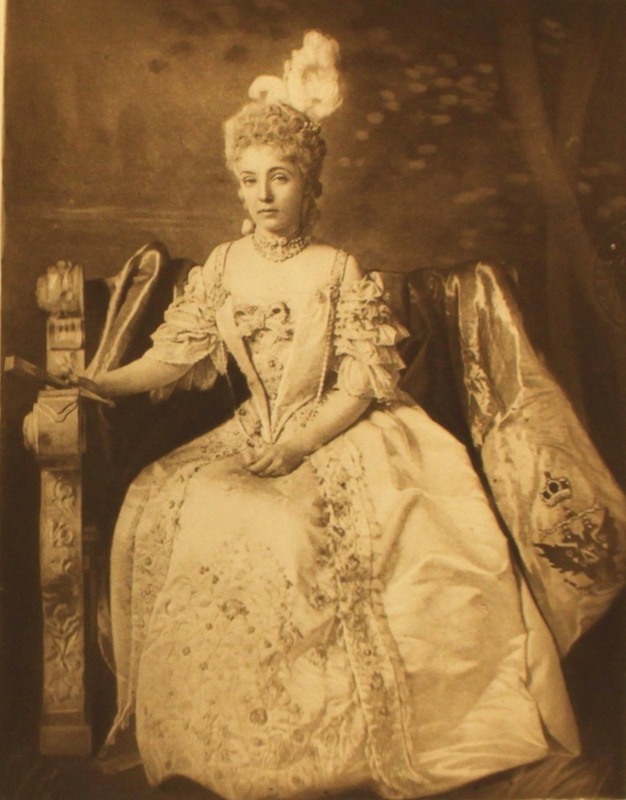 Sitting for the photographer is Lady Georgiana Curzon, (nee Spencer-Churchill) daughter of the 7th Duke of Marlborough (John Winston Spencer Churchill) and hence younger sister of Lady Tweedmouth and some kind of relation to the Duchess in the first picture. You can work it out. I’m going to follow Lady Georgiana’s example and lie down. 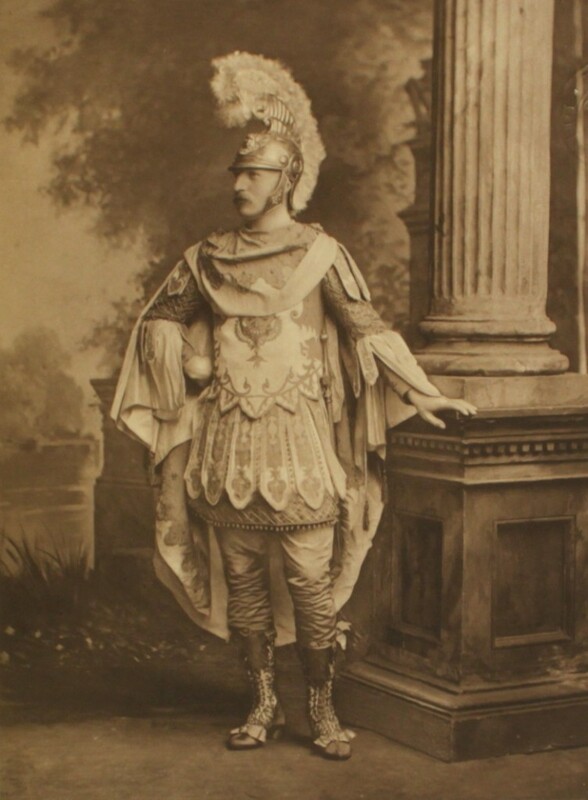 I hope you consider these fancy dress posts suitable for the post-Christmas period of idle entertainment. They’re usually popular anyway. We’ll be back to more local matters next week.The other costume ball posts here. I’ve just seen the Mayor’s firework display from my kitchen window. Not bad. A happy new year to you all. 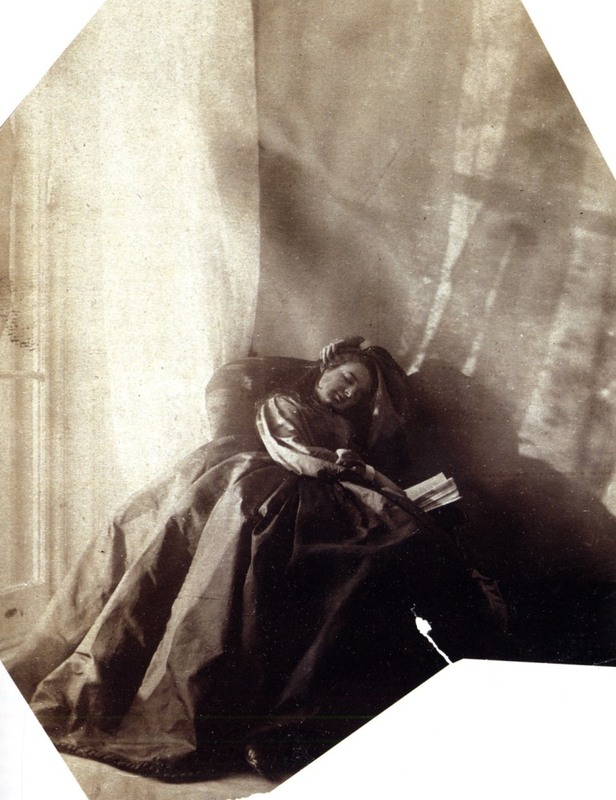 I’ve wanted to find a good reason to come back to Clementina, Lady Hawarden and her brief career exploring costume, fabric and light within the confines of a few rooms in her house at Princes Gardens. I only recently thought of an obvious way to look at her work as a fashion photographer as I suggested she was in my first post about her. 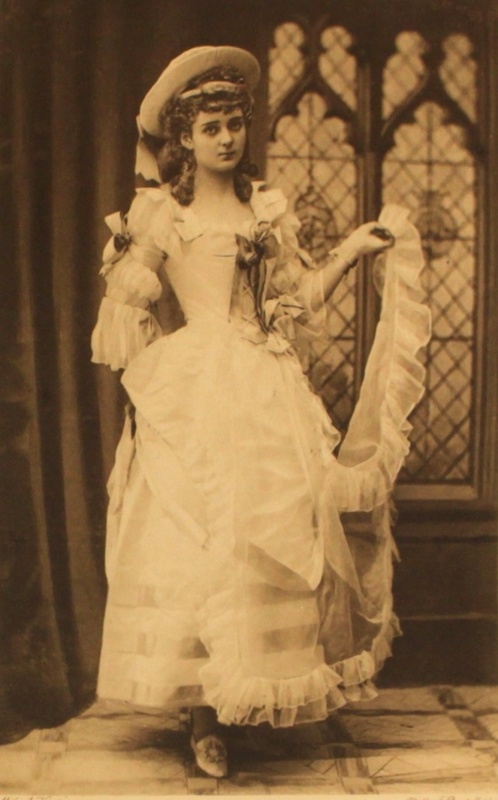 Here, in the room with the starred wallpaper, her daughter and principal model Clementina Maude, an elaborate dress draped around her adopts a pose which shows off the way the material falls over her body. 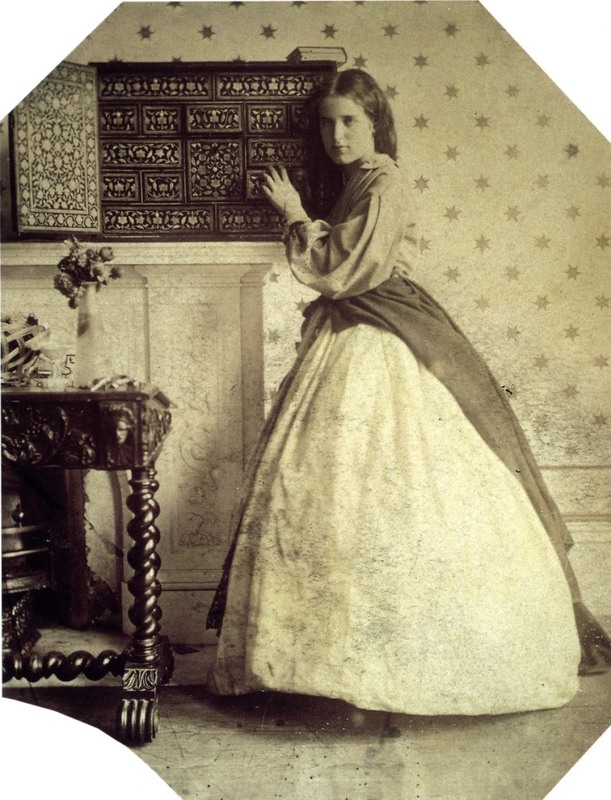 You want to call the pose langorous or thoughtful, which is the impression it gives, even though you know the young Clementina had to hold the pose for several minutes while the plate was exposed. Although the photograph has suffered over the years you can still see the contrast between the side directly lit by the light from the window and the greater detail visible on the other side. The light is falling from the other side in this picture by one of the modern masters of fashion photography Mario Testino and although the shutter speed was measured in seconds rather than minutes the same care has been lavished on the model’s pose and the way the dress hangs. 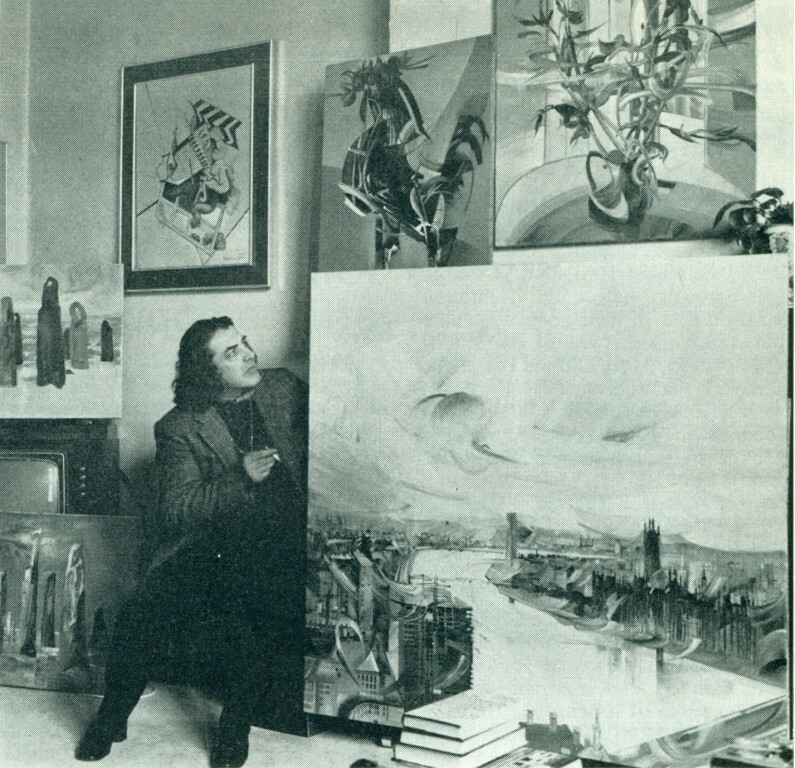 It may have been the search for available light that drew Lady Clementina to the windows of her improvised studio but she comes back to them repeatedly. Clementina again in some kind of fancy dress, Bohemian or gypsy perhaps, steps through the shutters from the balcony. 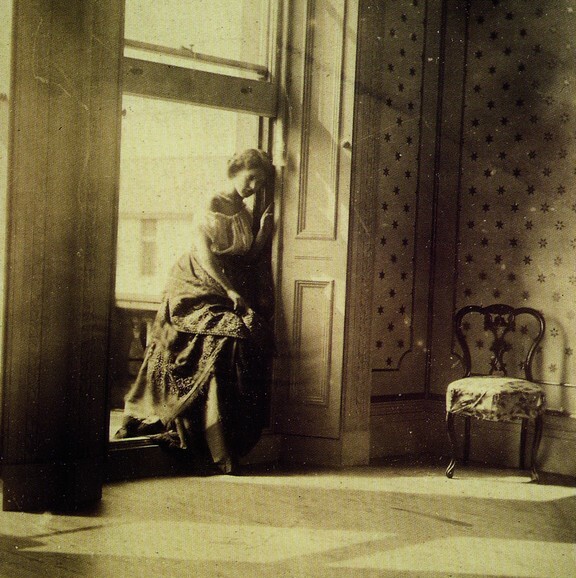 Below, a model negotiates a more complicated arrangement of wooden screens and windows in an equally sparsely furnished 19th century room. She has the same attitude of trepidation in this picture from a calendar for the Polish Embassy in Paris by Piotr Stoklosa. 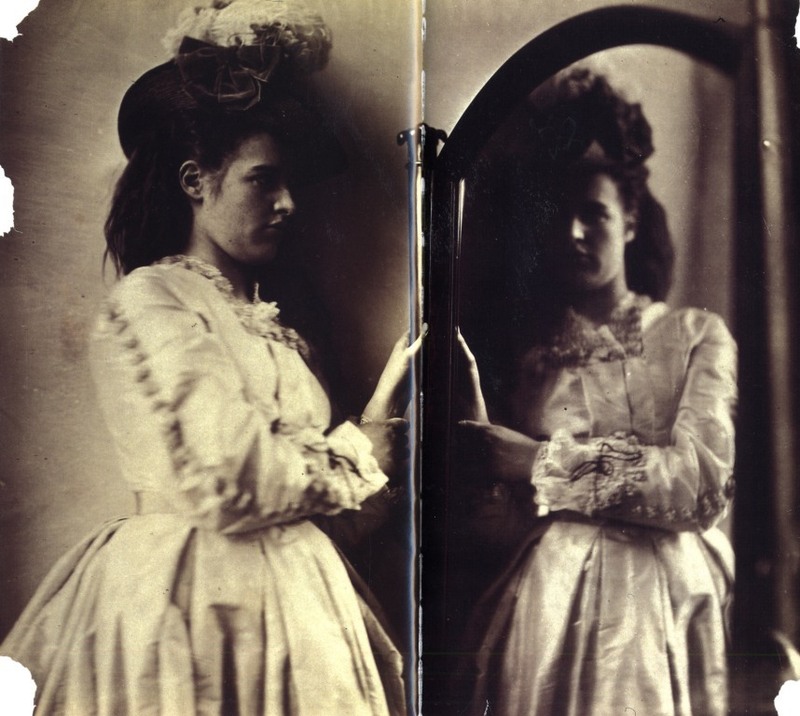 Lady Clementina’s other favourite prop was a mirror. When I get back we can remember that mirrors are always mysterious and always slightly threatening. Remember that quote from Borges? Here Clementina poses with the same mirror. If you look closely I think you can see that her mother has draped that white material with dark stitching on the border (which I pointed out in the first post) over her skirt. 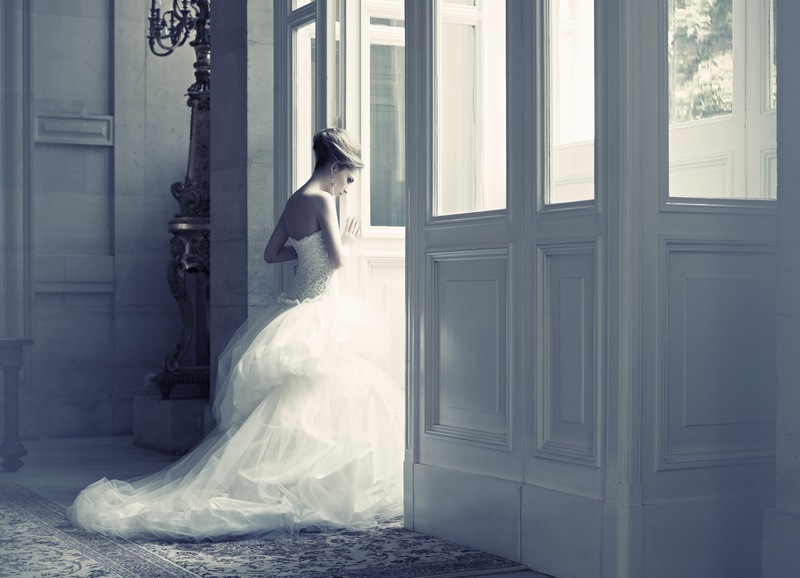 She probably isn’t wearing a crinoline underneath. Her mother is trying to achieve a softer shape. You can barely make out Clementina’s reflection. I’m not sure whether Gisele Bundchen is posing by an actual mirror in the photograph below or whether the photographer has caught the reflection in a window. 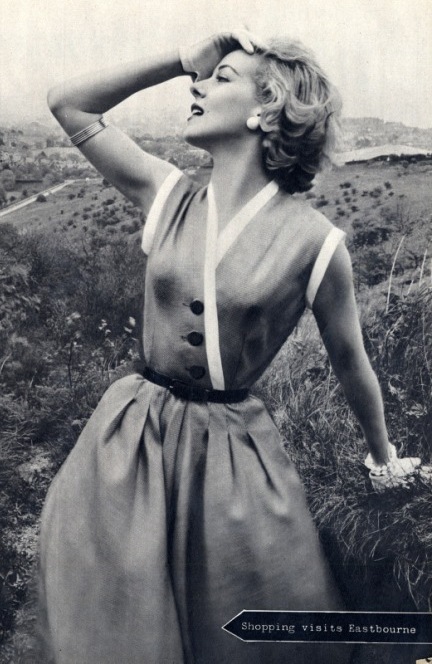 She isn’t wearing a crinoline either as you can see. 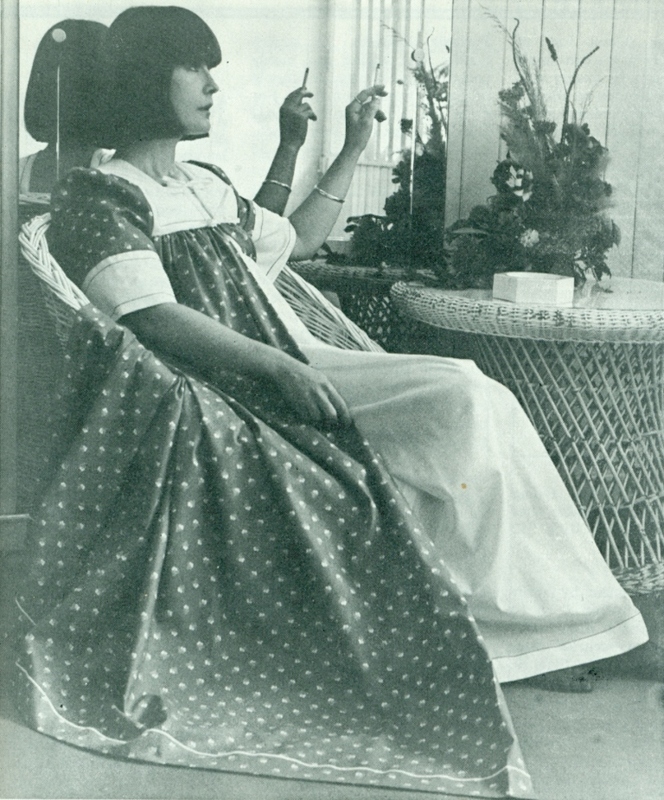 The pose, with one foot on the chair brings out the unstuctured flow of the dress. 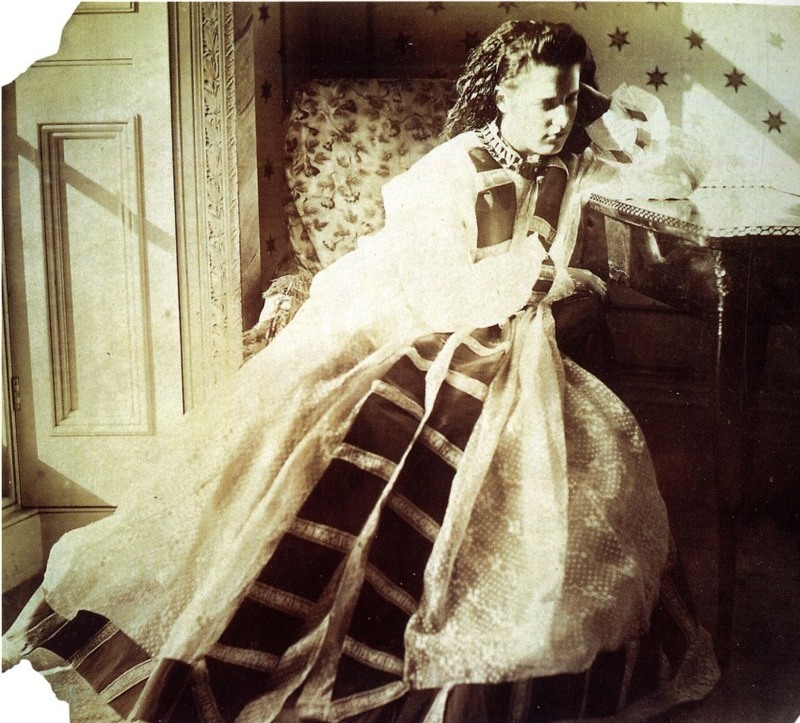 Clementina might not have posed exactly like this but some of her mother’s pictures show that she wasn’t bound by convention when creating her photographs. 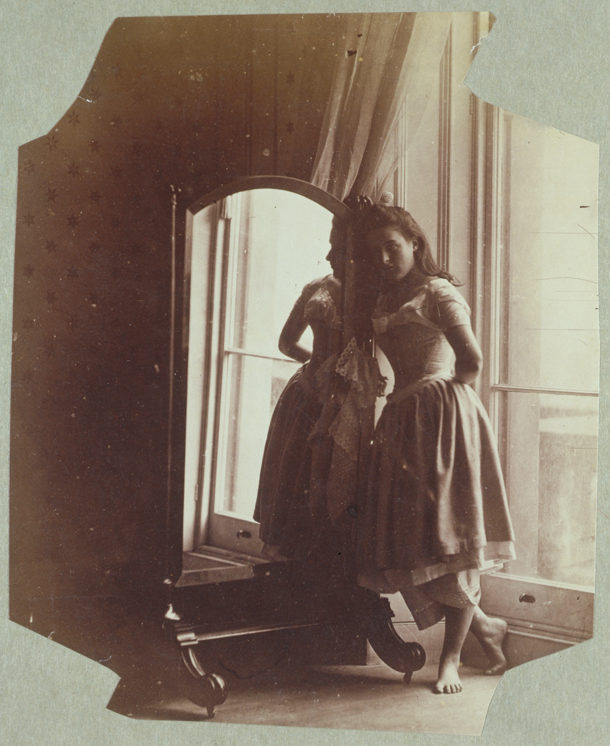 In this variation on a pose featured in the first post Clementina is barefoot and casual looking, as minimally dressed as a modern model, The shadowy light gives her an air of mystery and demonstrates a trust between model and photographer which could probably only have been achieved by a mother and daughter in the 1860s. In this 2010 picture from In Fashion magazine Evelina Mambetova has found a similar kind of pose combining a kind of casual awkwardness with an enigmatic stare. Can you bear much more of my amateur fashion-speak? 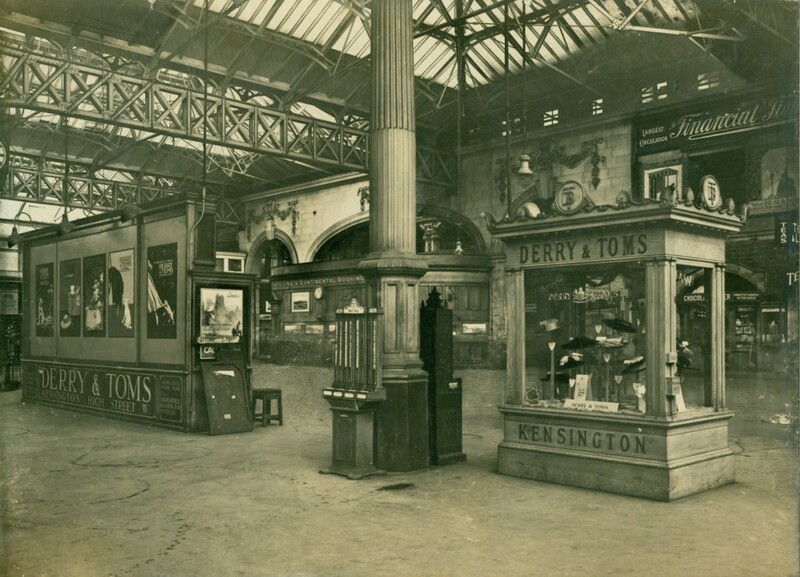 The point for me of looking at old photographs is finding the connection between then and now in the touches of modernity you can detect in photographs taken more than a hundred years ago. 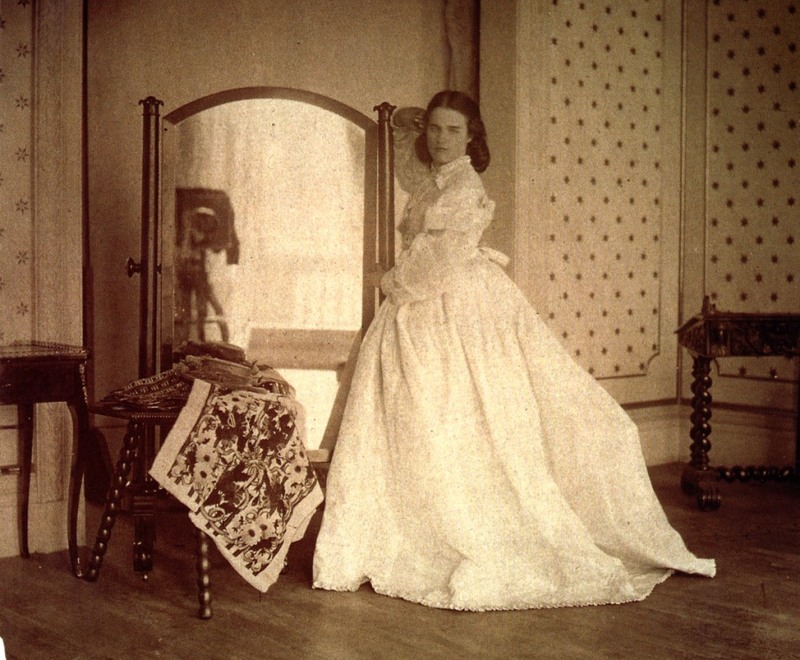 Below, in an ordinary day dress Clementina has a air of 21st century ennui as she stands by the door of the room with the starred wallpaper. Like many of the others the photograph is damaged and sections cut away but you can still recognize the melancholy in the figure which transcends condition and technique. This is one of my favourite Hawarden pictures, and it was hard to find a modern equivalent. The model’s stare is neutral in this case though the dress is dark enough to create the shadows. The model looks uncertainly back at the photographer which is effective, but perhaps with some photographs the same look can never be achieved by accident. Here Clementina poses with an odd but highly decorative set of miniature drawers in a cabinet which was another of her mother’s favourite props. Below another model stands in front of an odd cabinet. Below, Clementina affects to sleep on what looks like a makeshift bed. 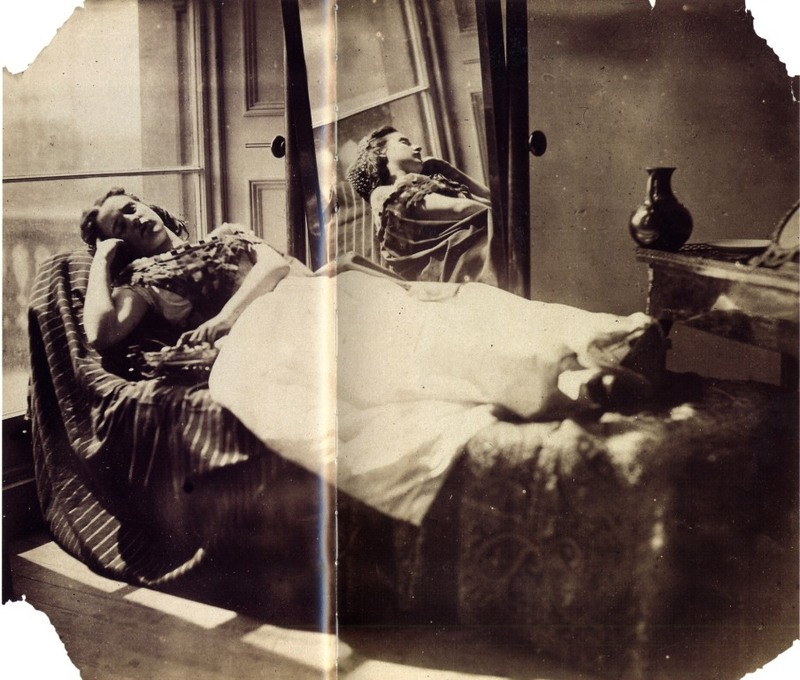 Clementina sleeping was another of her mother’s favourite subjects. She doesn’t look completely relaxed though. By contrast, this (unknown to me) model isn’t even attempting to sleep. 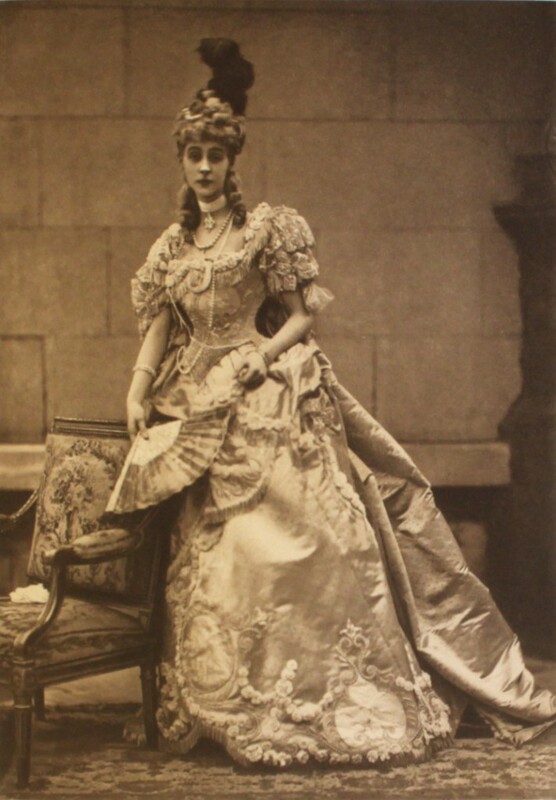 But I think Lady Clementina would have appreciated the fall of the dress material to the floor and the light coming from behind. The last comparison is another version of the sleeping model. In this case Clementina shows every sign of having actually dropped off while reading a book. Sleep is another mysterious area of life, subject to endless speculation and fantasy. It’s more evidence for me that Lady Hawarden was as preoccupied with the strangeness of existence as any other artist or writer of the period and that the impressions we read into her work – eroticism, feminity, dreams and death are not fantasies of our own construction but part of her intentions. This is unfortunately another damaged picture showing signs of age. It’s been compared to Lord Leighton’s Flaming June (painted long after Lady Hawarden’s death – could Leighton have seen it?). 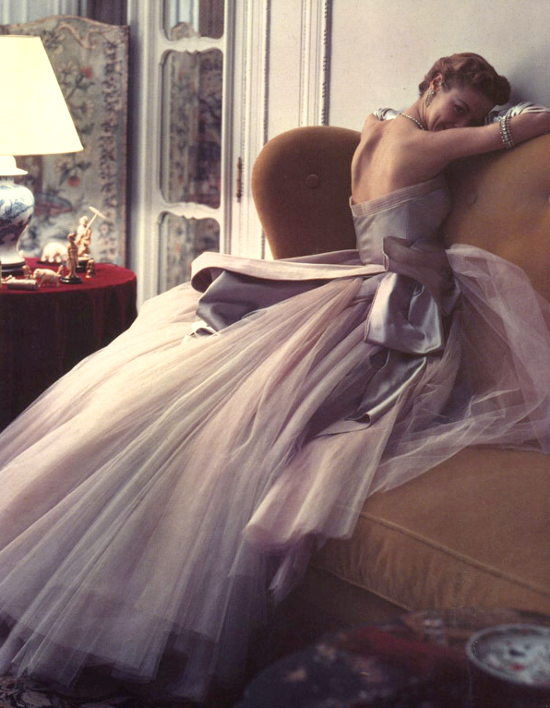 I haven’t been able to locate a close parallel in modern fashion photography, but I like this picture by Norman Parkinson of the model Jean Patchett in repose. This is a game you could play endlessly. Why not try it yourself? Here’s one of Clementina playing a classical (or occult?) role with a single star. As is often the case I was working on this post along with another speculative one when it occurred to me that I had better write something for this week, and the scanner was temporarily locked in the basement during some building work so it had better be something that was almost ready to go. 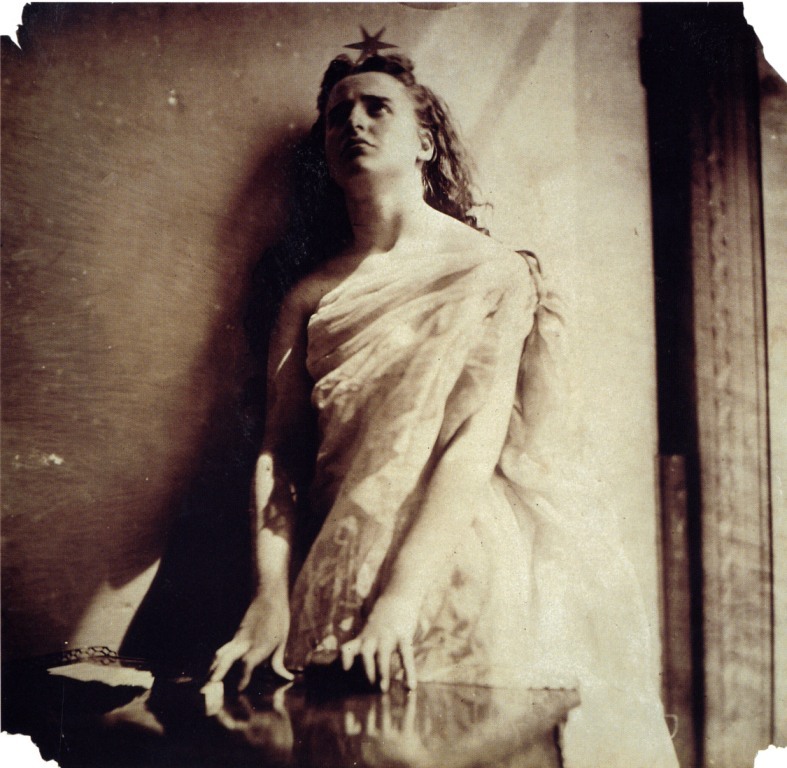 As a result I didn’t have quite as long to search for images which echoed Lady Hawarden’s work as I thought I would have. Some of them are more exact parallels than others. But you get the basic point I expect. Of course I could have just said “light-fabric-mirrors-women”. Most of the modern fashion images come from the archives of http://dustjacket-attic.com/ , one of the best websites concerned with fashion and design, which I highly recommend. http://www.fashiongonerogue.com/ is another good one. Like other bloggers say, if I have infringed anyone’s image rights by using them here just let me know. Oh yes, and that Borges quote: “Mirrors and fatherhood are abominable to God, for they multiply the redundant images of Man”. This sentence has been translated in a variety of forms over the years, but this is how I remember it from my first reading of Fictions back in the 1970s. Lady Hawarden and Lewis Carroll might well have had an interesting dinner party with Borges. 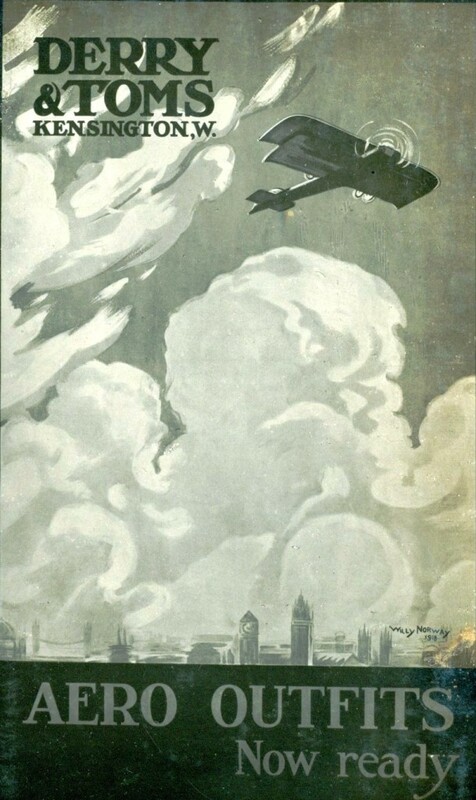 Finally, I have a World War 1 piece on the Library blog here. Is this picture a good enough match for the final one? 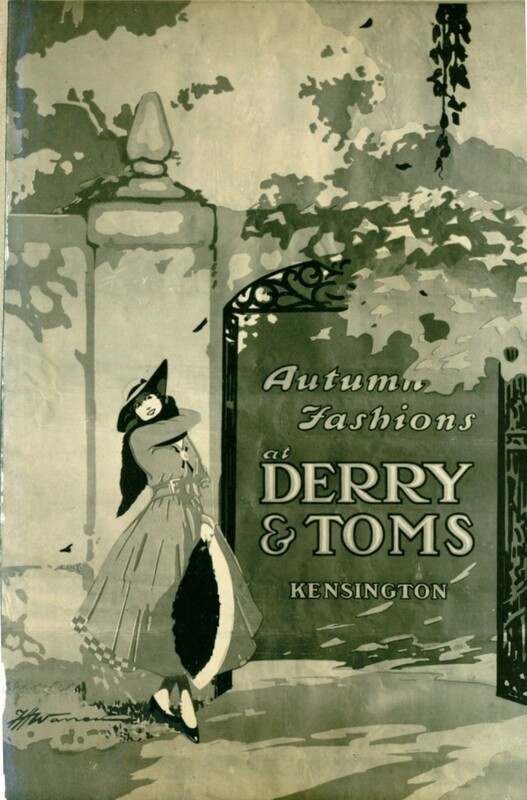 Although I spent my childhood far from Kensington, in the 1960s I did once visit the High Street and its famous triumvirate of department stores, Barker’s, Derry and Tom’s and Ponting’s. Even as a disinterested teenager I could recognize the distinctive high class air of the three establishments. 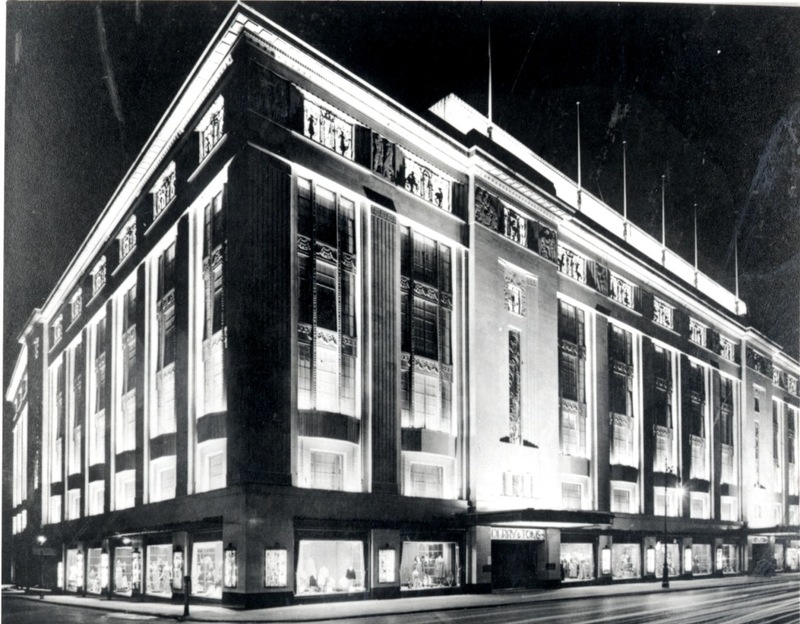 Many people I’ve spoken to have reported that Kensington High Street was regarded as a cut above shopping destinations like Oxford Street, if not quite as exalted as Knightsbridge. 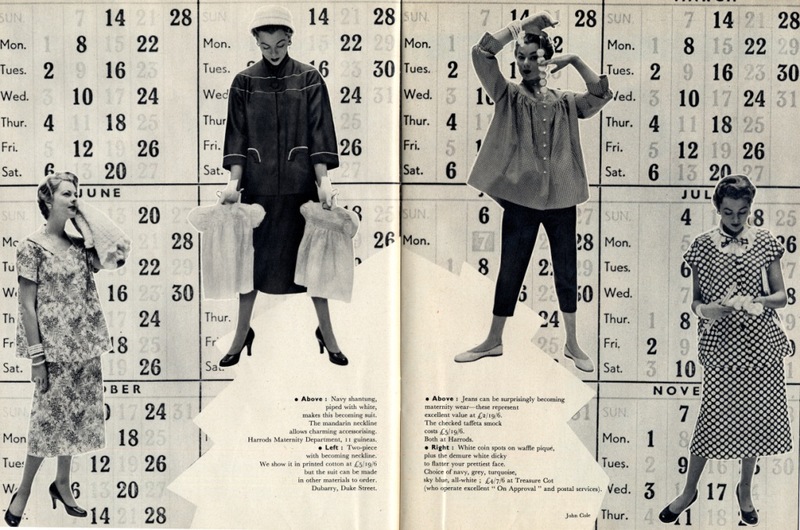 The 1950s were the heyday of that shopping experience. 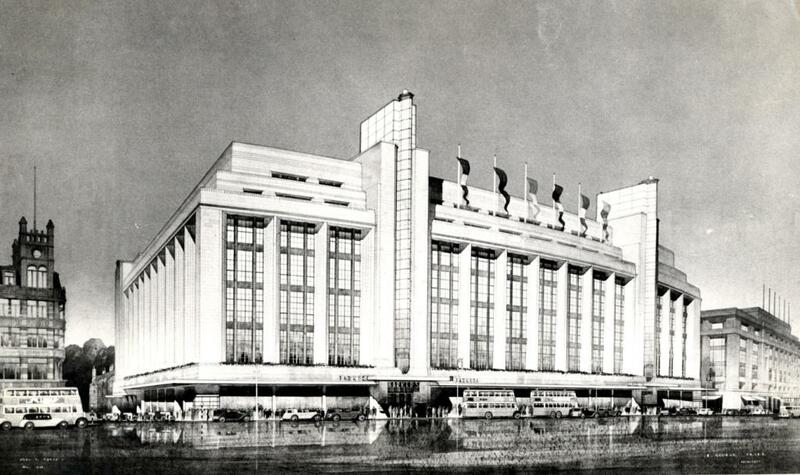 An artist’s impression of Barker’s in 1955 with Derry and Tom’s on the right. 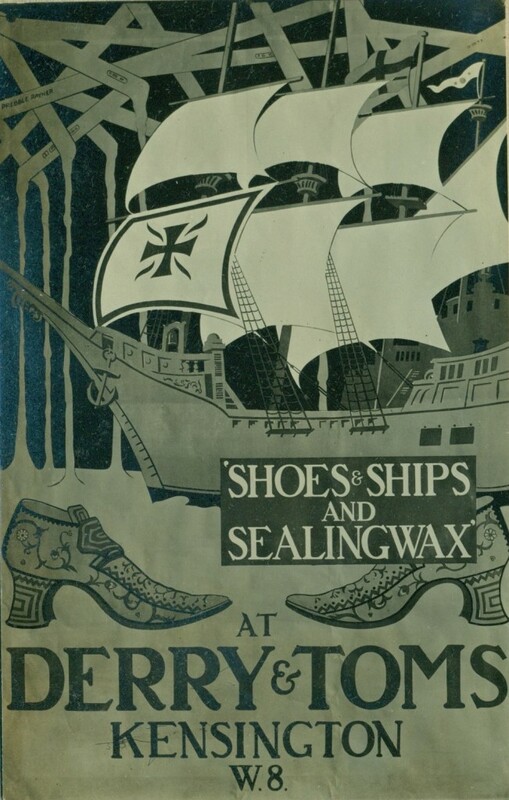 The slightly curved, prow of a ship frontage and the series of flags demonstrates the absolute confidence of the John Barker company in its store. 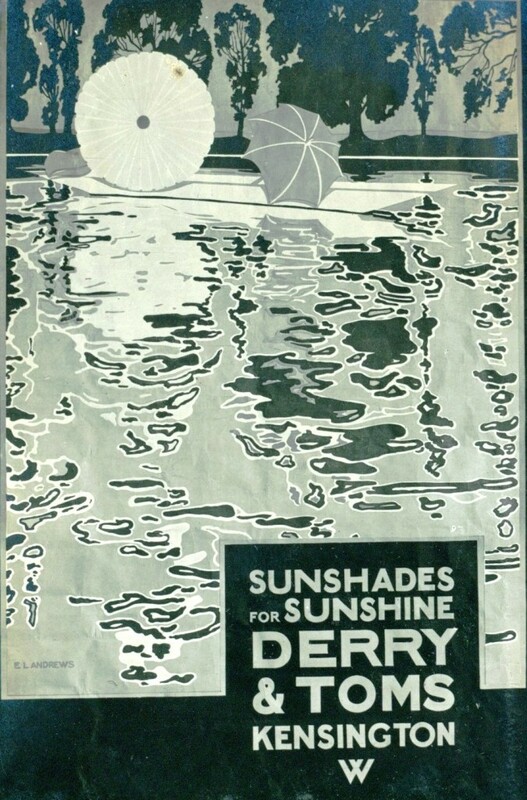 This night time picture of Derry and Tom’s from 1933 shows a similar stylistic pride in its image. The three stores catered primarily for the middle class woman who had shopping as one of the key activities in her job description. 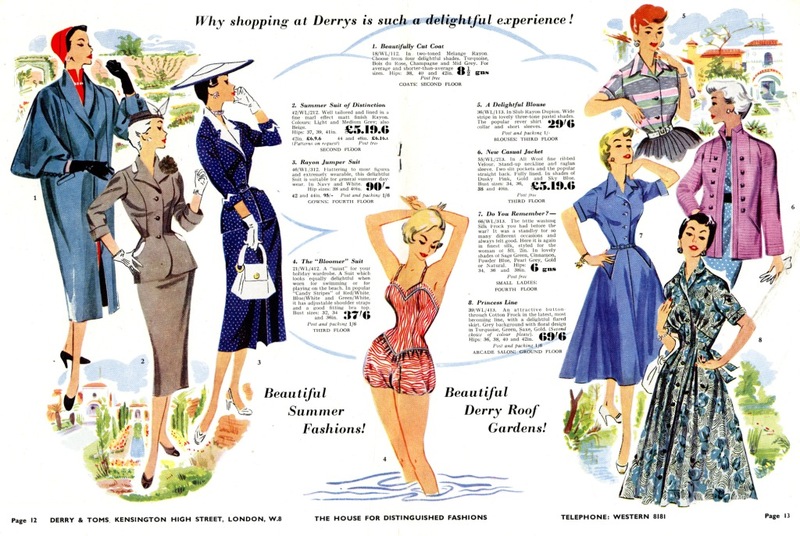 And as their customers came from far and wide the shops used in-house magazines and catalogues as part of their promotional efforts. 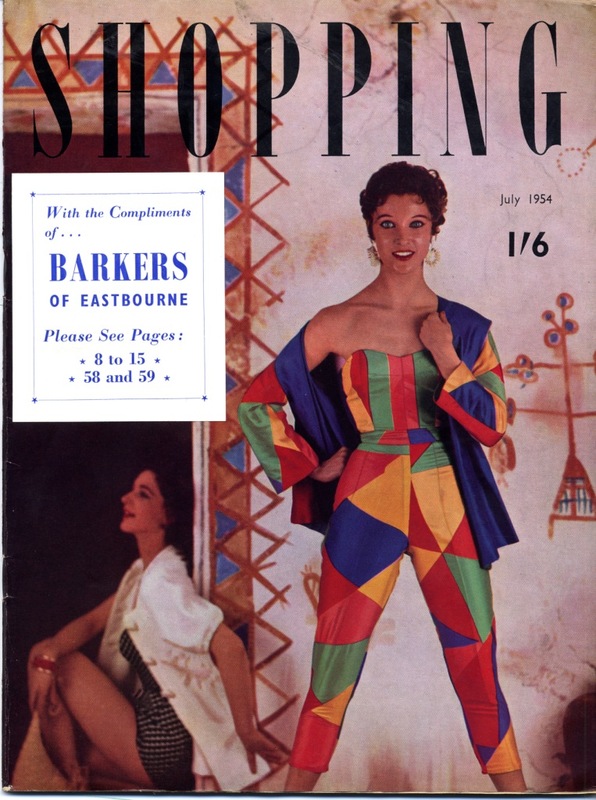 July 1954’s issues of Shopping was concerned with Barker’s satellite store in Eastbourne and was geared towards summer fashions. A bright summer’s day at the seaside but no beachwear in sight. It looks a bit windswept in fact. 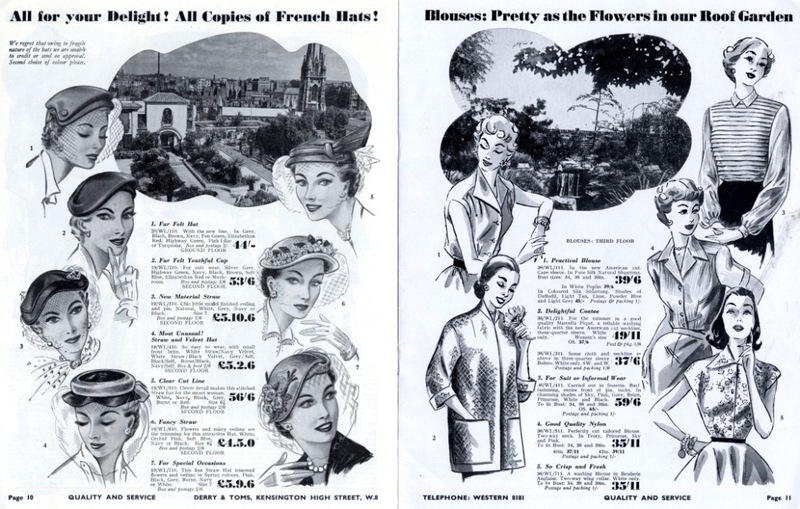 The famous roof garden, an integral part of the store identity. 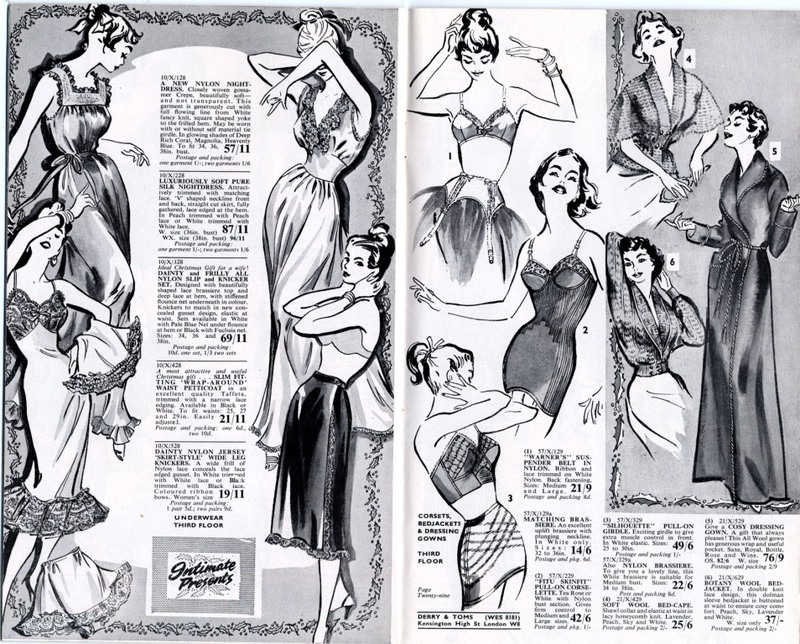 The 50s were also a heyday for the commercial artist. If you can’t make out the small print what about the Triang Minic Garage Service Station or the Toy Fort, or the Chemistry Set (with Bunsen Burner)? 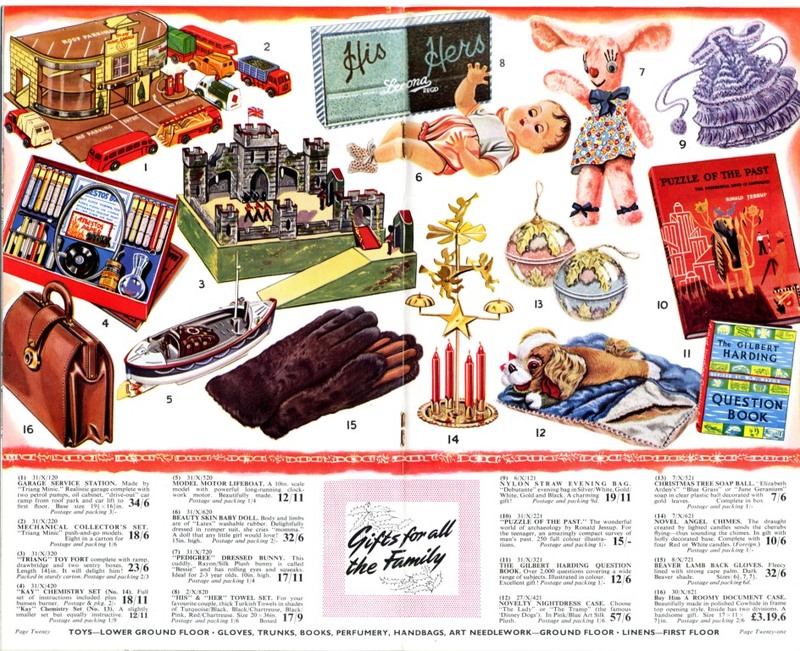 There’s a His and Hers towel set (thick Turkish towels at 17/6), or some Beaver Lamb Back Gloves (32/6). The Pedigree Dressed Bunny at 17/11 shows how soft toy technology has advanced since the 50s. For the curious, the Gilbert Harding Question Book (an early version of QI?) 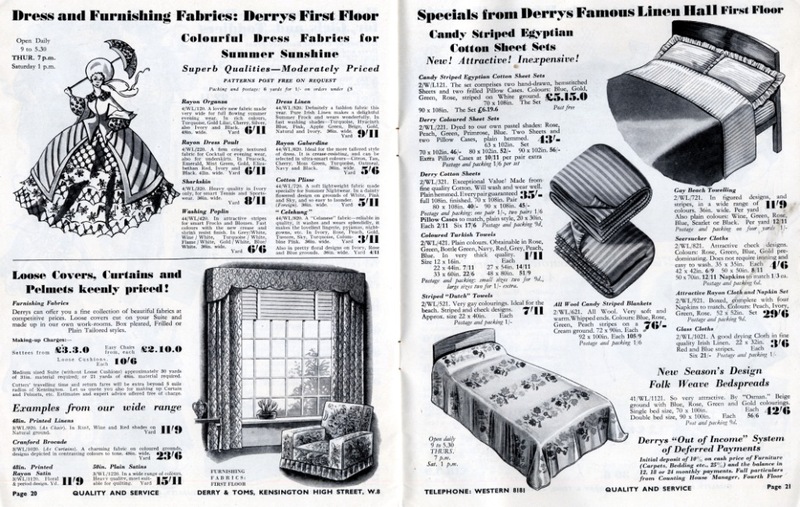 And for Her, a Novelty Nightdress Case or a Nylon Straw Evening Bag. 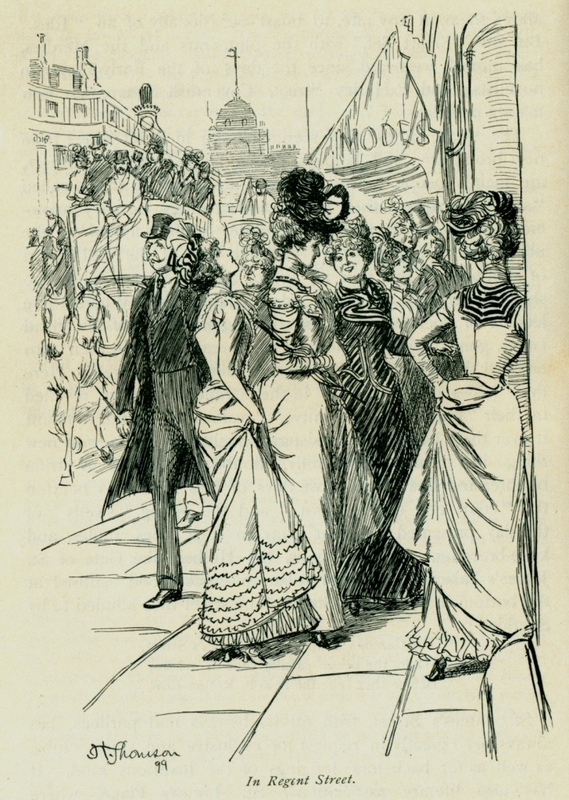 Most of the year the ladies were shopping for themselves, and the stores offered “a delightful experience”. 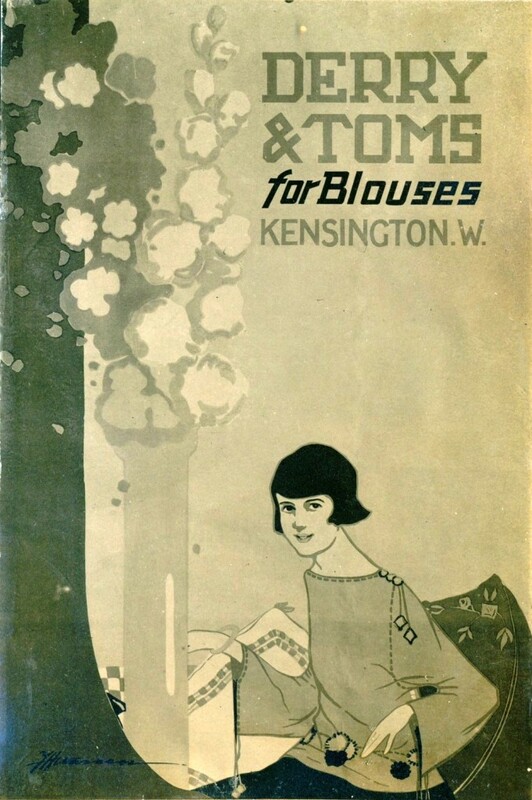 Whenever I do a shopping related post someone always asks me when I’m going to do something about Biba? 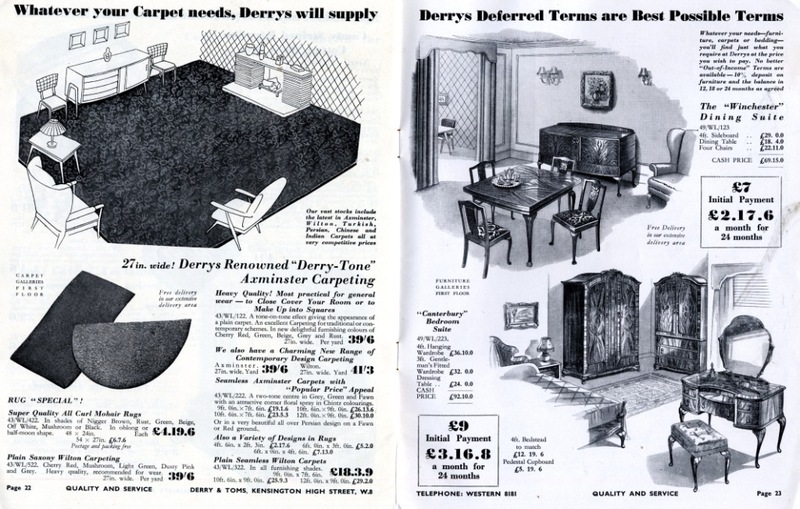 The unfortunate answer is that the collection has almost no pictures of Biba in the period when it took over Derry and Tom’s. 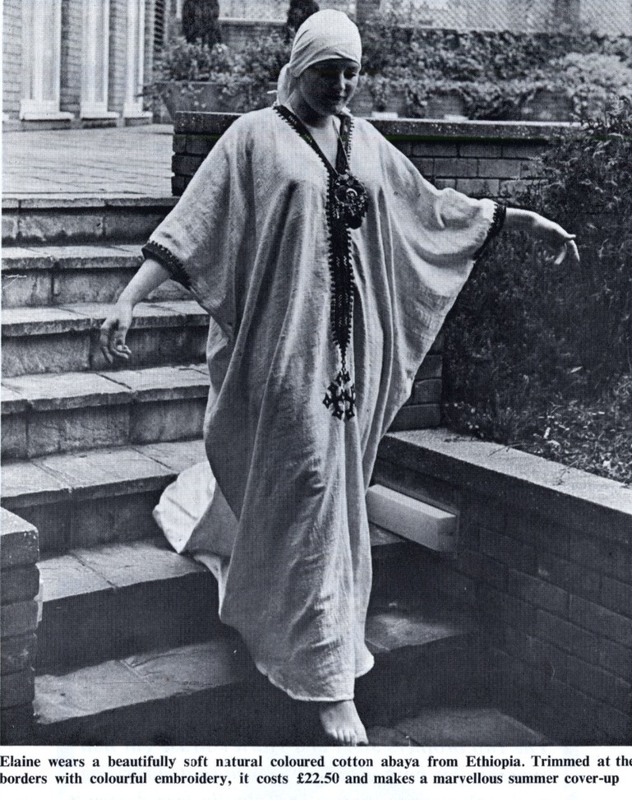 So it’s my turn to ask: does anyone have any photos of Biba in that era (particularly of the interior) that we could scan and use on the blog? 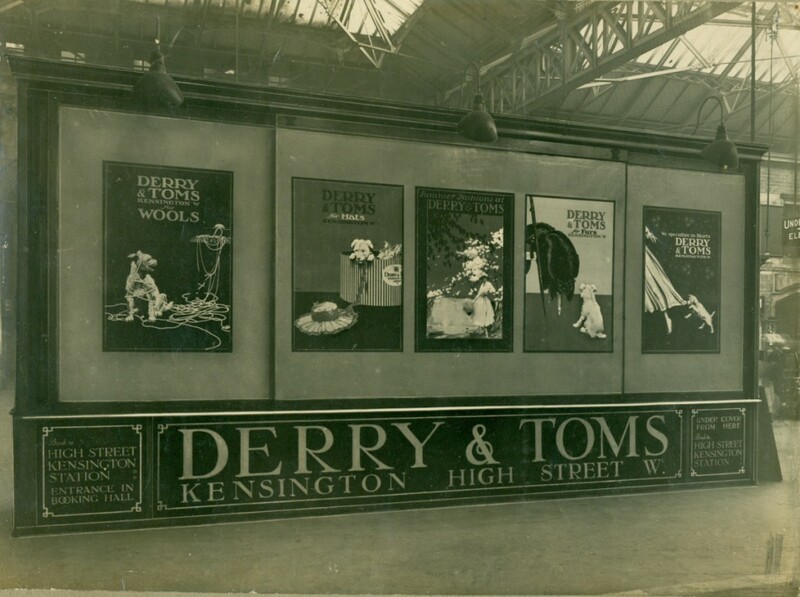 Curiously, while working on this week’s post I found some interior pictures of Pettit’s, the least known of the High Street’s shops, which I might use one of these days.